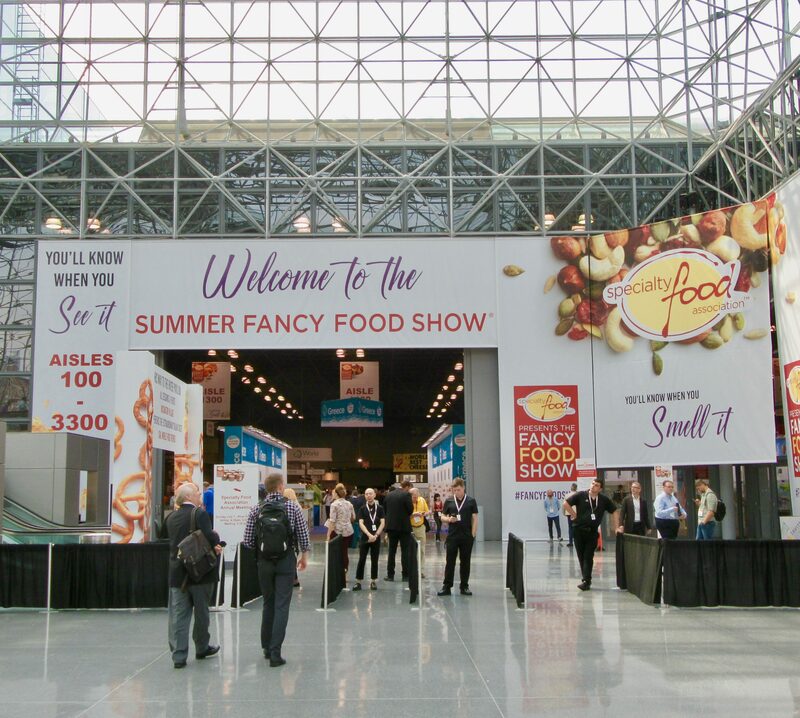 Favorite Products, Packaging and Booth Displays From The Summer Fancy Food Show 2018! Oh my goodness, you know I must have been having a crazy fun summer when the season is essentially over before I can even get around to posting my always-hotly-anticipated annual photo recap of the Summer Fancy Food Show, 2018 edition! I have no excuse, except to admit that there is too much rad fun going on over here! Please forgive my tardiness, Specialty Food Association — I promise I will make it up to you with this awesome coverage that you are about experience. To kick things off, let me give a round of shout outs to the considerable number of tasty edibles that you should be putting in your mouth right now. Let’s do his thing! How luscious do those chocolate-enrobed morsels look in the above photo? Please allow me to introduce you to Michelle’s Maccs — the Macaroon of the Gods. 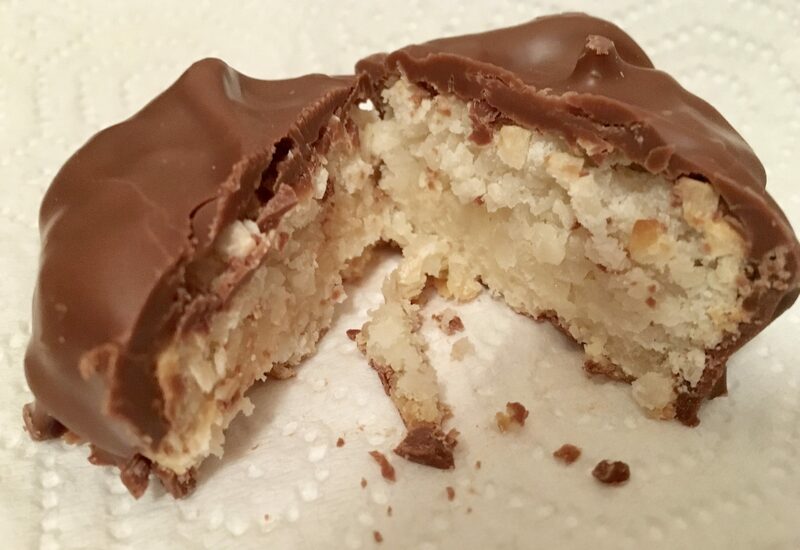 If you are a fan of coconut, then you need to get hip to Michelle’s Maccs, an elite coconut macaroon that comes in 13 gourmet varieties — including Amarena Cherry, Peanut Butter, Orange Zest, Banana Walnut (with little bits of real banana) and Espresso — each covered either milk, white, or dark Belgian chocolate. Decadent. Check out this close up of the Simple Milk variety: dense with sweet, chewy coconut and drenched in rich Belgian Milk Chocolate. Irresistible! Handcrafted with simple, high-quality ingredients, Michelle’s Maccs are eggless, flourless and naturally gluten-free. 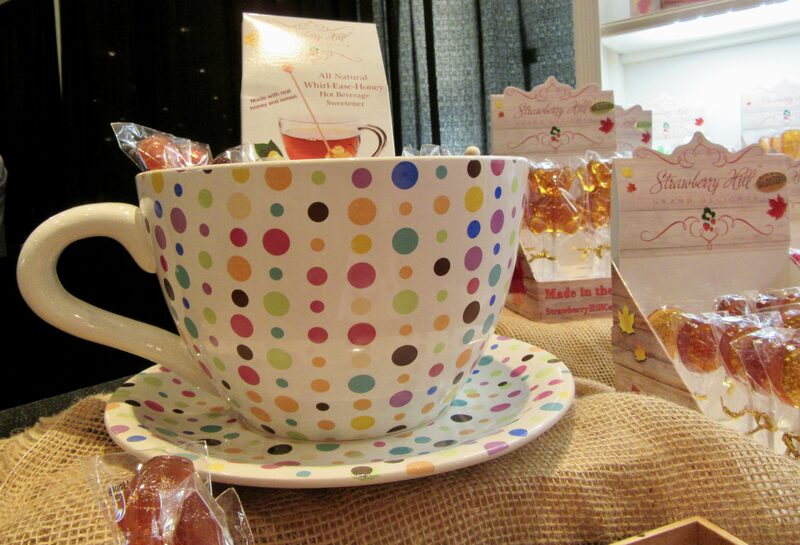 What a perfect confectionary treat for yourself, or to give as a gift. 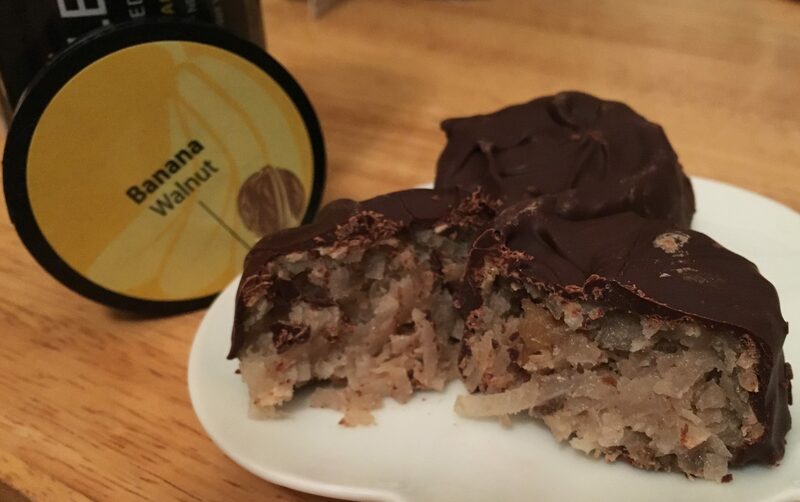 Michelle’s Maccs’s are part of the full line of gourmet baked goods from Fresh Baked NY, and you can find out more about them at This Link! 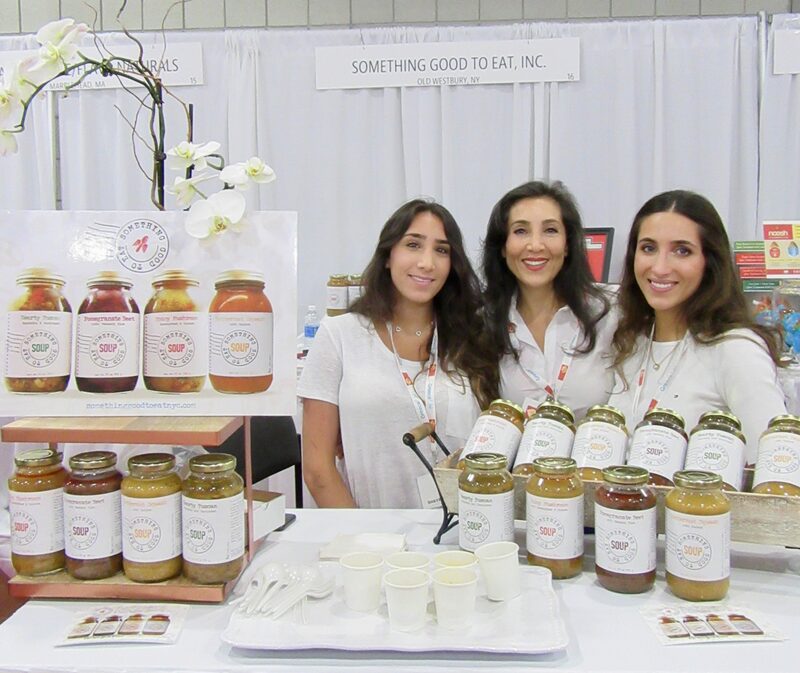 Over in the New Brands on the Shelf aisle, we met the lovely ladies behind Something Good to Eat Soups! Meet Sandy Khorrami and her two beautiful daughters. 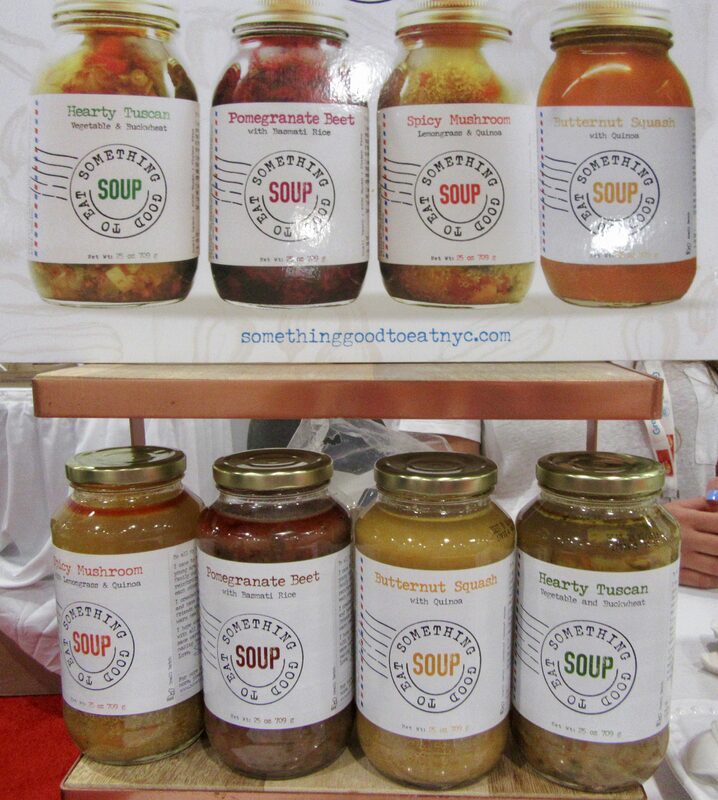 Something Good to Eat is a line of hearty and exotic soups made in small batches right here in NYC. Vegan and sugar-free, with no preservatives or stabilizers, these delicious soups are as close to homemade as you’ll find outside of your own kitchen! Inspired by her own mothers home-cooking, Sandy has hand-crafted original recipes for unique soup flavors like Pomegranate Beet with Basmati Rice (which reflects Sandy’s Iranian heritage), and Spicy Mushroom with Lemongrass and Quinoa. Delicious served hot or cold, Something Good to Eat is a brand to put on your radar. Another new brand exbibiting at SFFS for the first time is Peekabo Organic Ice Cream. 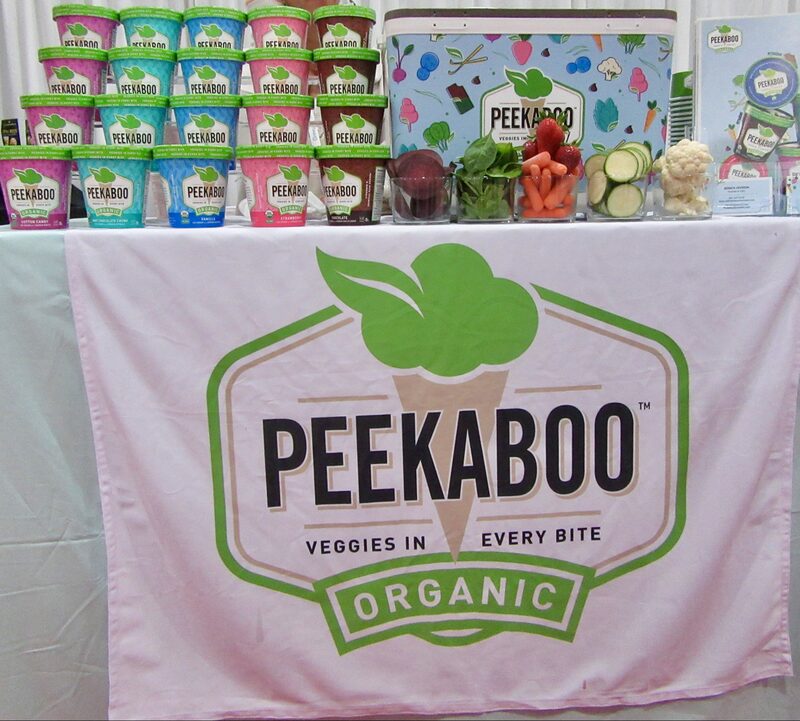 What makes Peekabo a unique product is the main ingredient hiding in each flavor — fresh vegetables! Take their Chocolate ice cream, made from the finest cocoa and pure, sweet cream to create a decadent, velvety dark chocolate ice cream. And the hidden cauliflower is providing your kids with a variety of vitamins, folate, fiber, potassium, protein, phosphorus and magnesium — wow! Eating your vegetables never tasted like this before! 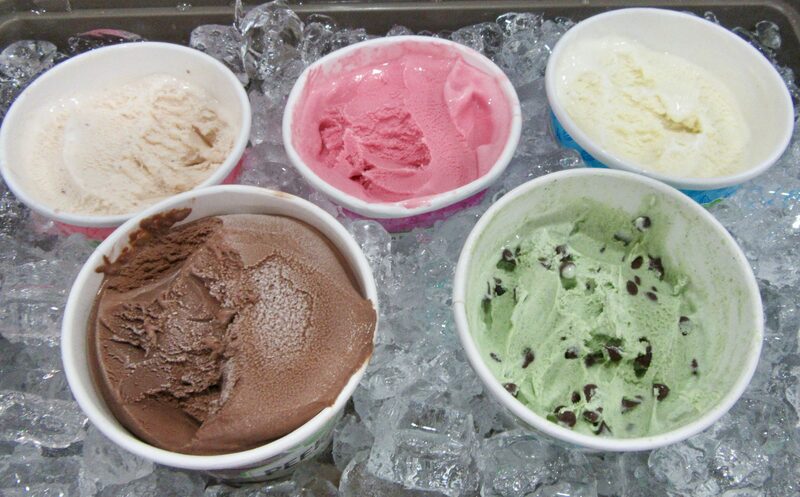 Other Peekabo flavors include Strawberry with Hidden Carrot, Mint Chip with Hidden Spinach, and Vanilla with Hidden Zucchini. Scoop them up at your local grocery! 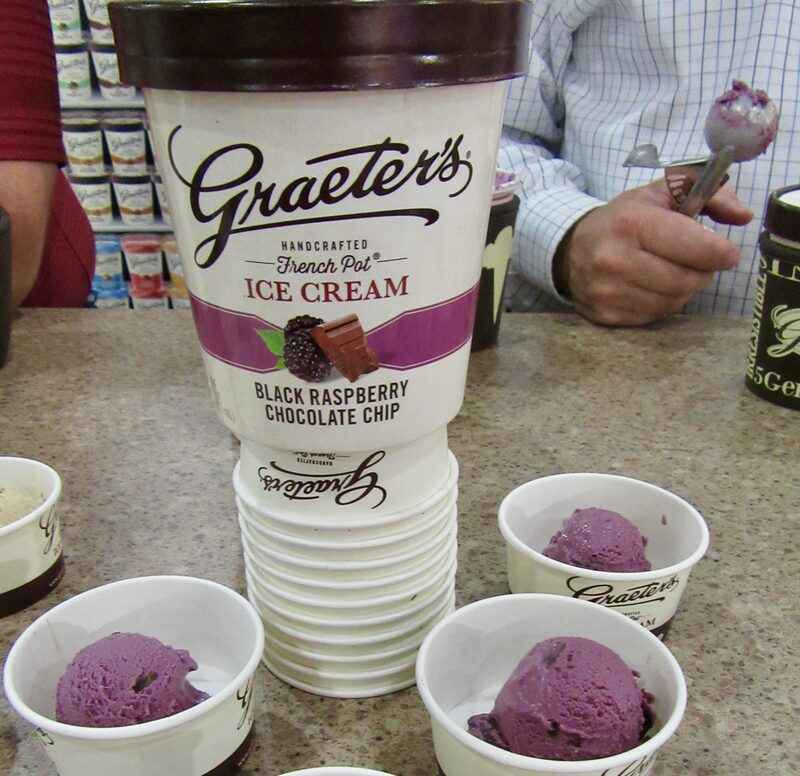 I was first introduced to Graeters Ice Cream at SFFS 2016 and so it was nice to see the brand thriving at this year’s show. Their Black Raspberry Chocolate Chip totally owns me. 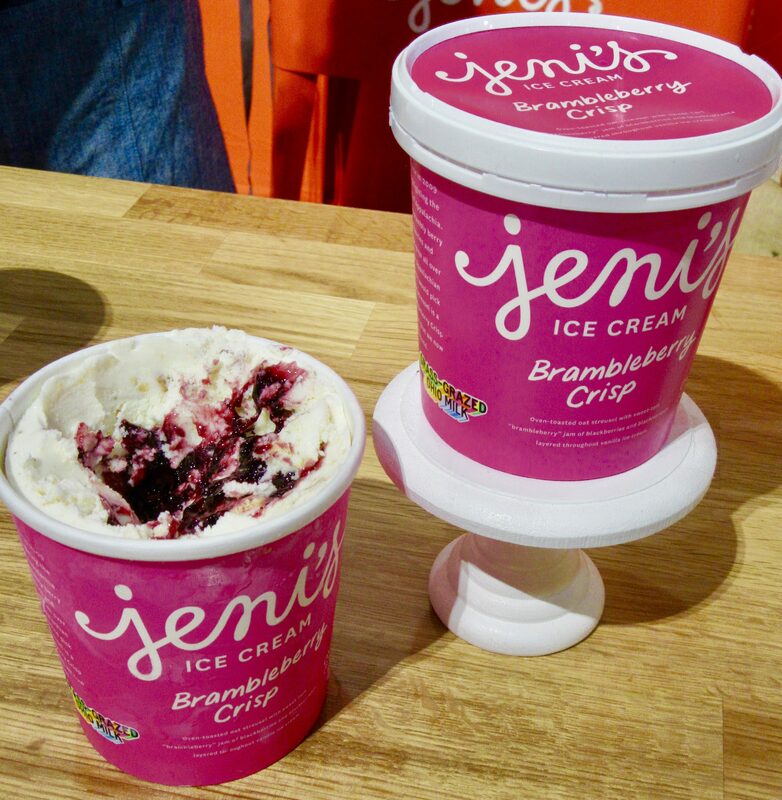 Jenji’s Ice Cream wins Best Ice Cream Flavor Name for their scrumptious Brambleberry Crisp variety! 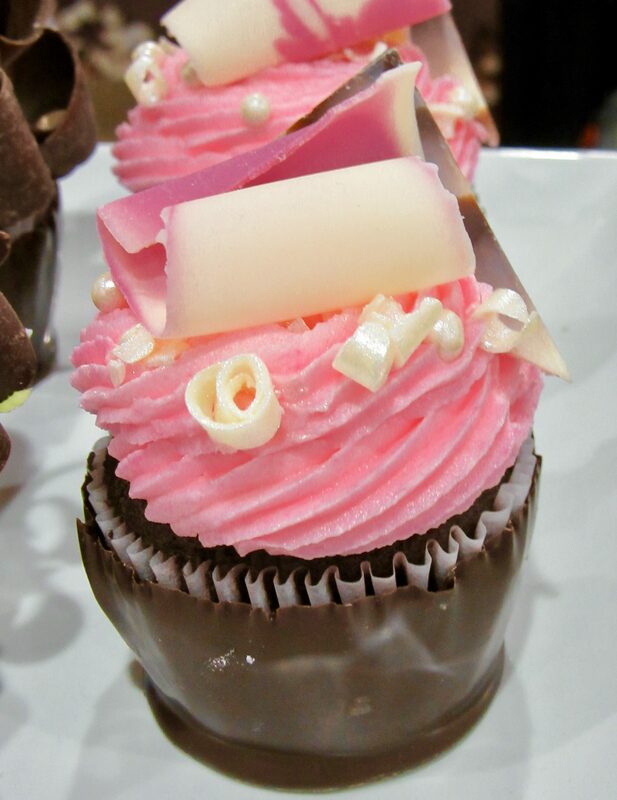 Sugar Bowl Bakery, a family owned company based in Hayward, CA, bakes a variety of bite-sized cakes and pastries that are perfect for lunch bags, afternoon tea, or easy snacking when you really want to treat yourself. 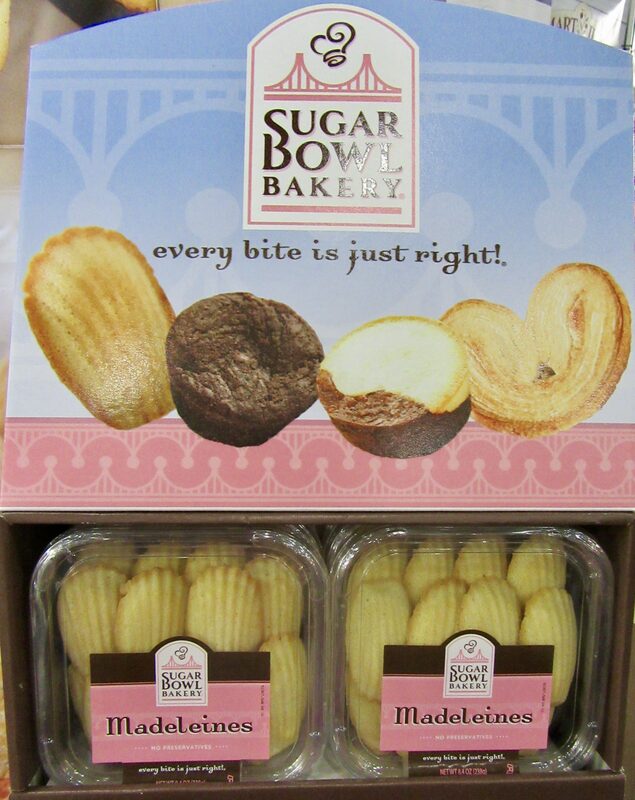 Possibly my single favorite new sweet discovery of SFFS18 were Sugar Bowl’s Duet Bites; tiny cakes that uniquely blend chocolaty Petite Brownie Bites with buttery Madeleines cakes. Dessert perfection achieved! Also introduced at SFFS18 are the bakery’s new Button Cakes, which are on shelves now. Button Cakes have the look, texture and taste of tiny, bite-sized muffins and come in four tempting flavors including Tropical Mango, Wild Blueberry, Lemon Zest and Madagascar Vanilla. 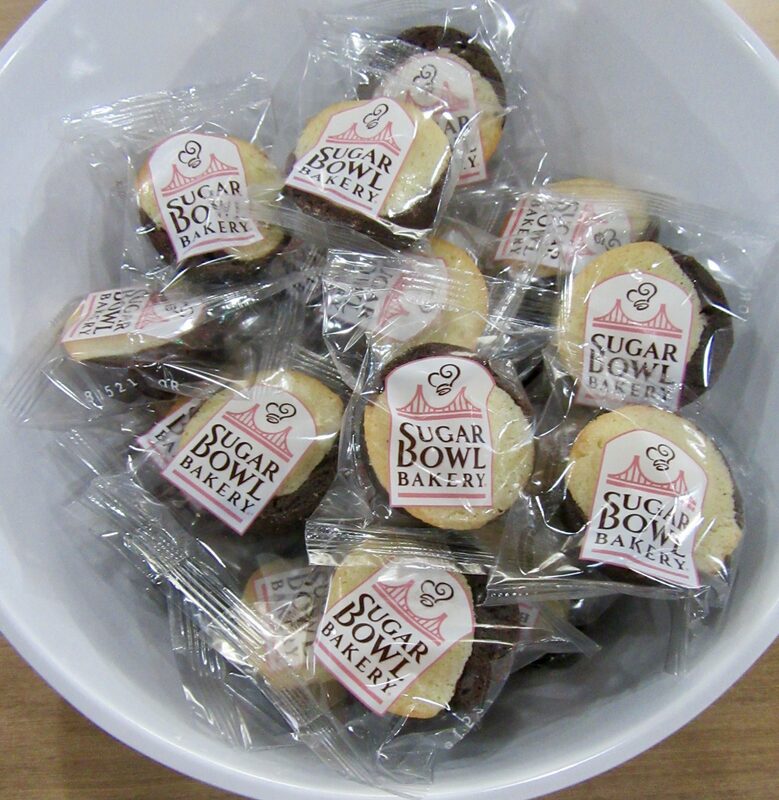 Sugar Bowl Bakery’s Button Cakes contain real fruit and vanilla bean seeds, with no artificial flavors, colors or preservatives. 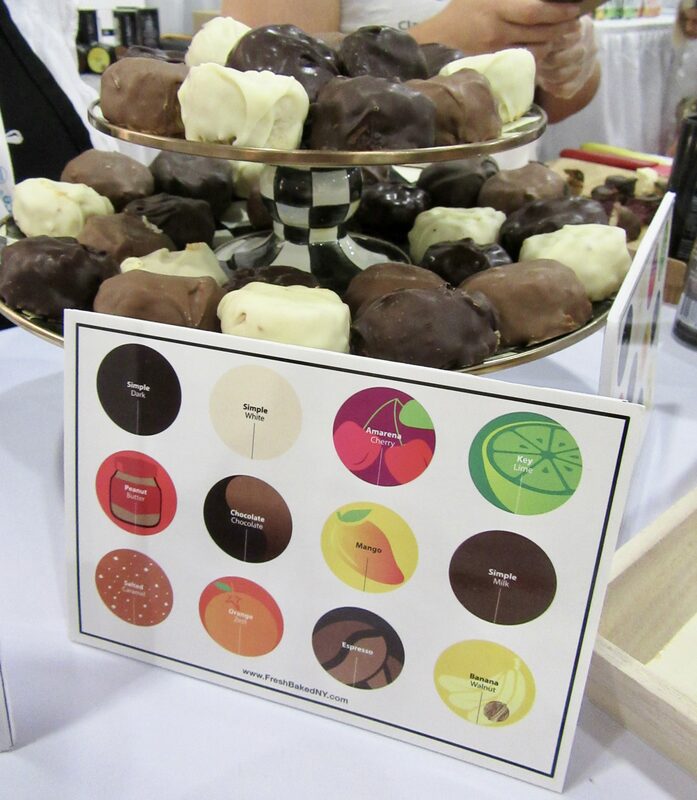 The Button Cakes are available in 8 and 16-count packages, with distribution throughout the United States. 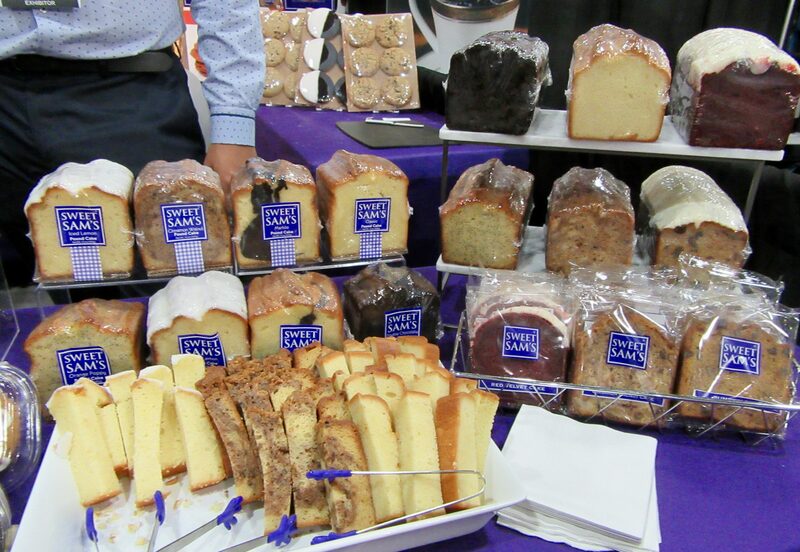 While I’m talking about delicious cakes, I recommend the gourmet pound cakes from Sweet Sam’s. If you’ve ever raved about the moist and addictive Iced Lemon Pound Cake sold at Manhattan Starbucks stores, you should know that their secret supplier is Sweet Sam’s! In fact, this Bronx-based baking company supplies over 500 New York-area coffee bars, gourmet markets, delis and other businesses with pound cakes, cookies, crumb cakes and other baked goods. Fine quality deserves its rewards! UK-based Dina Foods produces high-quality, traditional Mediterranean breads and pastries in both sweet and savory varieties. 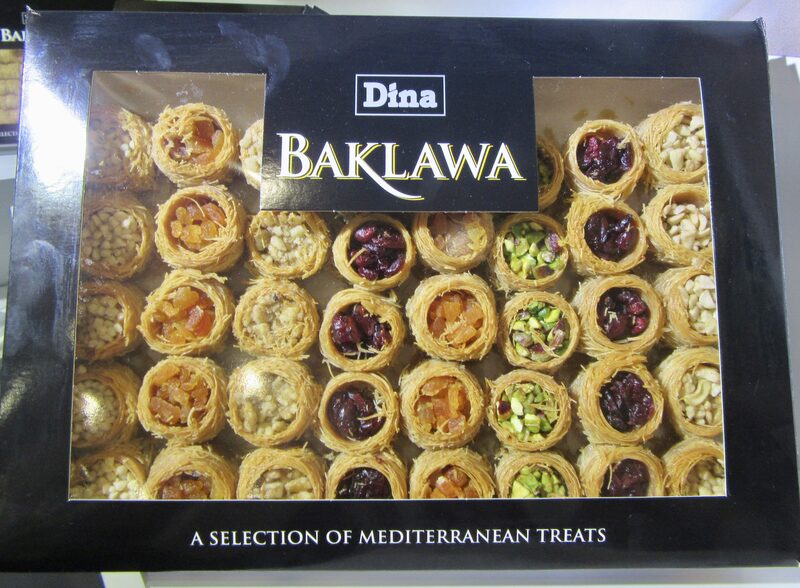 Their Assorted Baklawa, seen above, is a show-stopper. 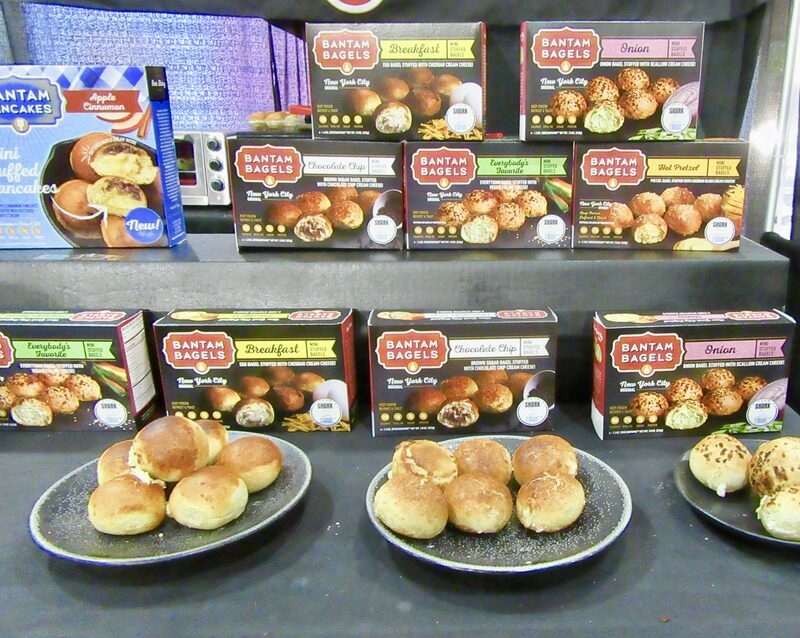 Bantam Bagels first blew up the frozen breakfast foods market with their innovative bite-sized, cream cheese-stuffed bagels. Now they have introduced Bantam Bagels’s Egg Bites Mini Breakfast Sandwiches, which are just fantastic! What could be more delicious than a crisp, chewy authentic NYC bagel puff stuffed with gourmet soft scrambled egg and cheese combinations? I ask yez . . . 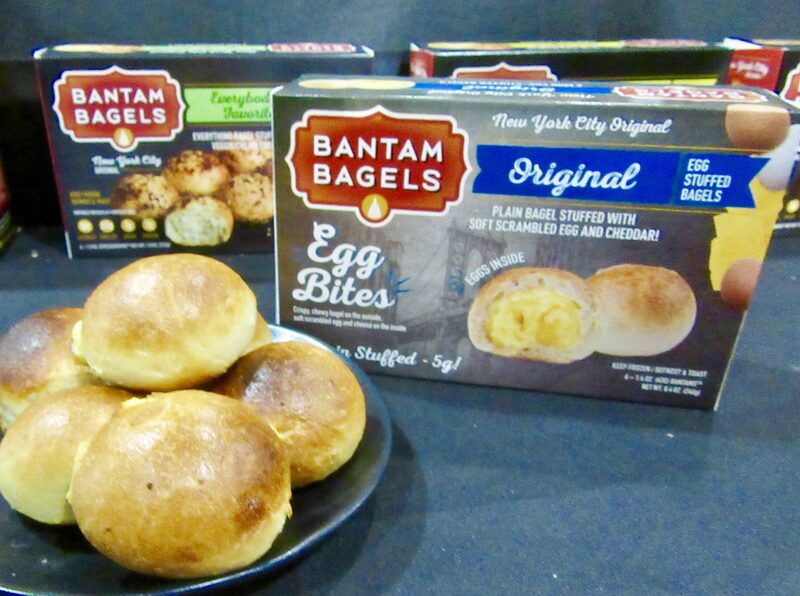 Available in Everything Bagel with Cheddar, Chipotle, Garden Veggie, Onion Gruyere, and original Egg and Cheddar flavors, Bantam Bagels Eggs Bites are one of my favorite savory discoveries at SFFS18! Frontera Gourmet Mexican Cuisine is based on the authentic recipes of Celebrity Chef Rick Bayles. Frontera’s new Taco Skillet and Taco Bowl meal kits elevate the convenience of frozen meals to entrees that will remind you of your favorite Mexican restaurant! 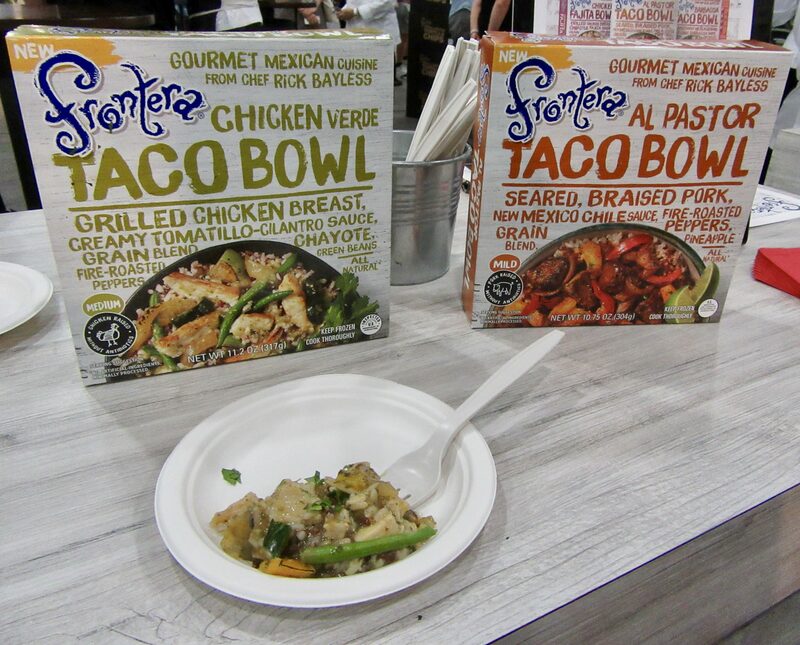 Made with fresh, classic ingredients like fire-roasted veggies, tender, delicious meats, and layers of authentic seasonings, Frontera Taco Bowls and Skillets will help you make a healthy and flavorful Mexican meal for the family that’s ready in just minutes! Fiesta! And if you’re looking for some crispy chips to go with that south-of-the-border meal, why not sidestep the usual tortilla chips and go for something completely different, like Tumbis brand Plantain Strips and Cassava Strips? Imported From Costa Rica by Barzu International, these high quality strips are 100% Natural, with no trans fat and no cholesterol. 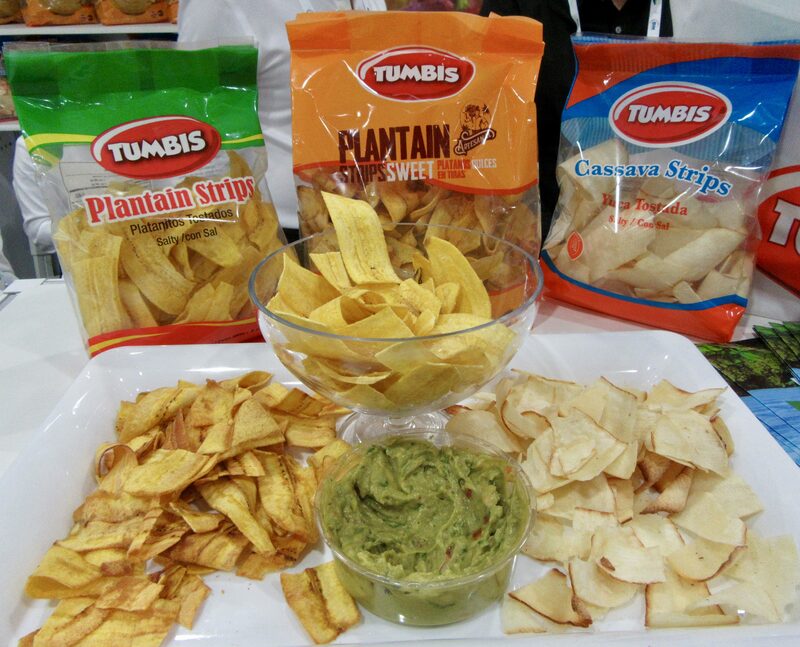 Tumbis Plantain and Cassava strips are also high in fiber and potassium, so you can indulge with much less guilt! And they sure do taste divine with your favorite homemade guacamole recipe. 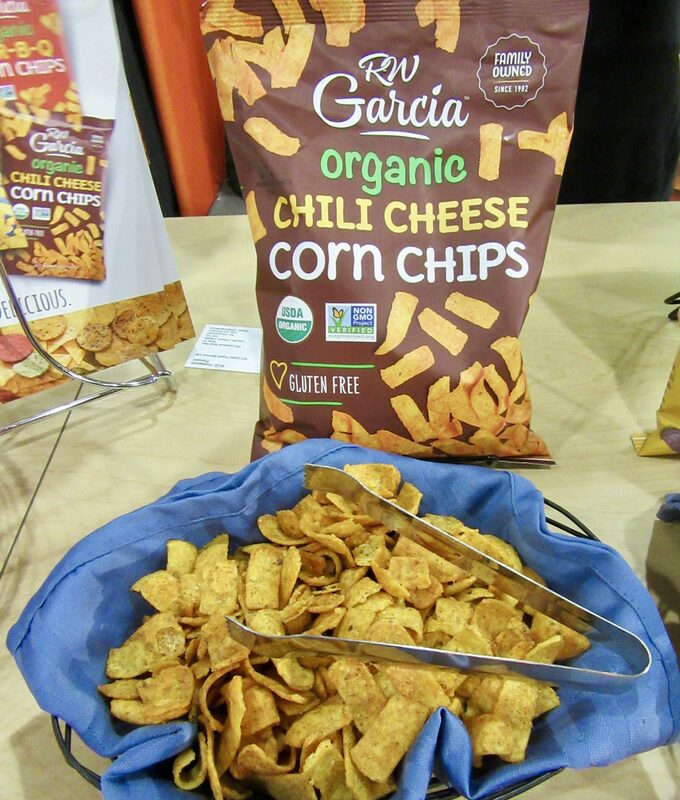 I also flipped for these Organic Chili Cheese Corn Chips from the family-owned RW Garcia brand. Chili plus cheese plus corn chips means the name alone sounds too tempting to resist! I want to crunch a mouthful of them even as I type this. 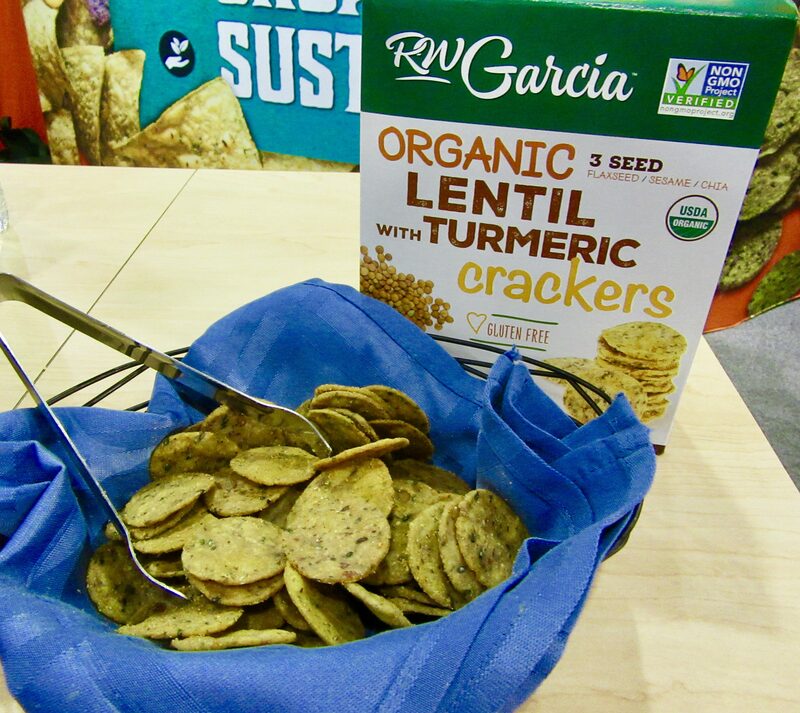 At the show, RW Garcia introduced two varieties of organic, gluten free crackers including Organic Lentil with Turmeric (which is so healthy for you) combining natural ingredients like lentils, stone ground white corn, and a sprinkling of seeds, to create a delicious, crunchy cracker. You can now snack with confidence knowing that these delicious crackers are made with 100% USDA Organic and Non-GMO ingredients, no cholesterol and no trans fats. Do you like Pasta? I sure do? But, being a single gal, I also (obviously) appreciate convenience when it comes to preparing a meal for one. 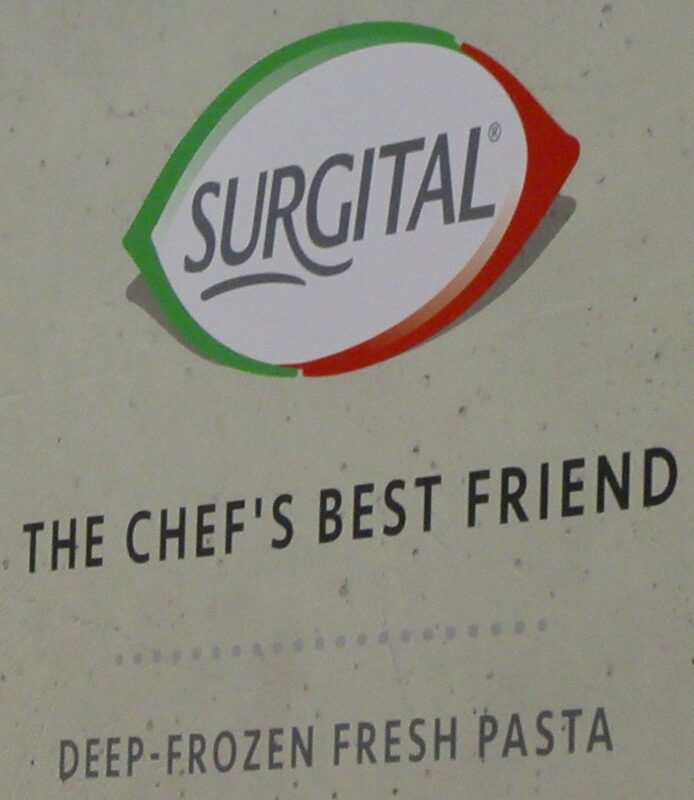 That’s why Surgital Frozen Fresh Pasta is not only The Chef’s Best Friend but my best friend as well. 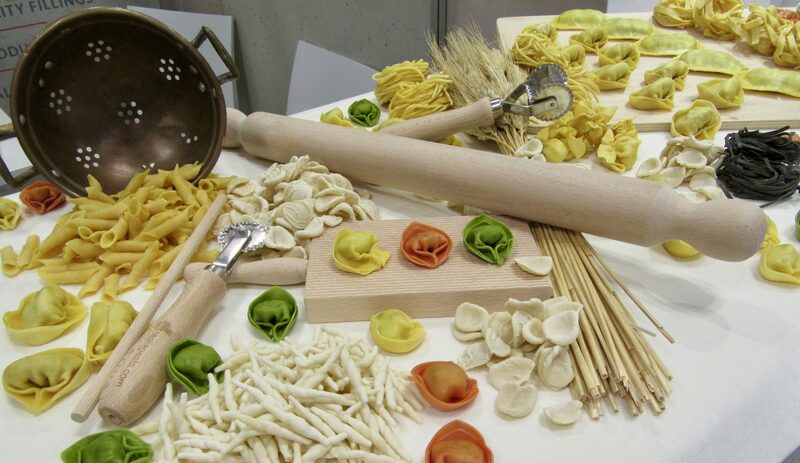 Look at all of these different types of Surgital gourmet pastas that you can buy to cook at home. Just look at them! While all Surgital products are imported from Italy, they are available for you to purchase in select US markets. Visit This Link for more product information and local store locations! Mangia! Eating non-stop for five hours is thirsty work. 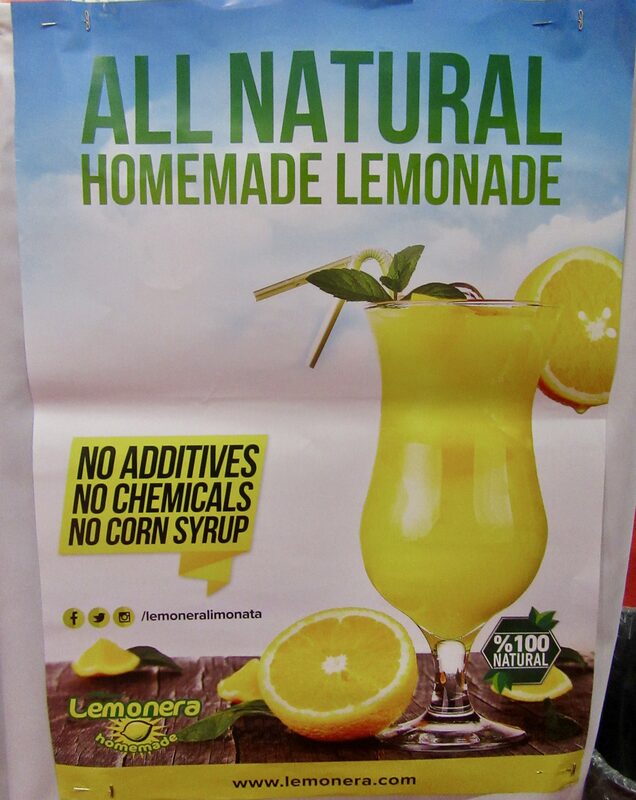 I enjoyed a glass of refreshing Lemonera all-natural Homemade Lemonade between bouts of stuffing my face. 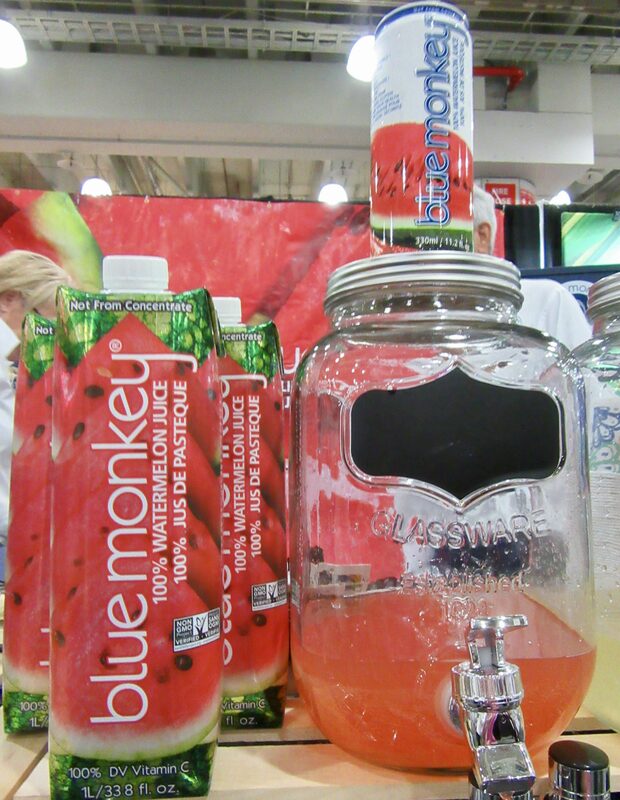 Another guaranteed thrist-quencher, Blue Monkey Watermelon Juice is probably even more refreshing when mixed with the Vodka of your choice! Cheers! While I’m walking the show floor, I like to pay attention to products that not only taste great, but that also have some kind of unique or on-trend flavor variety, a funny or clever name, or unique packaging. 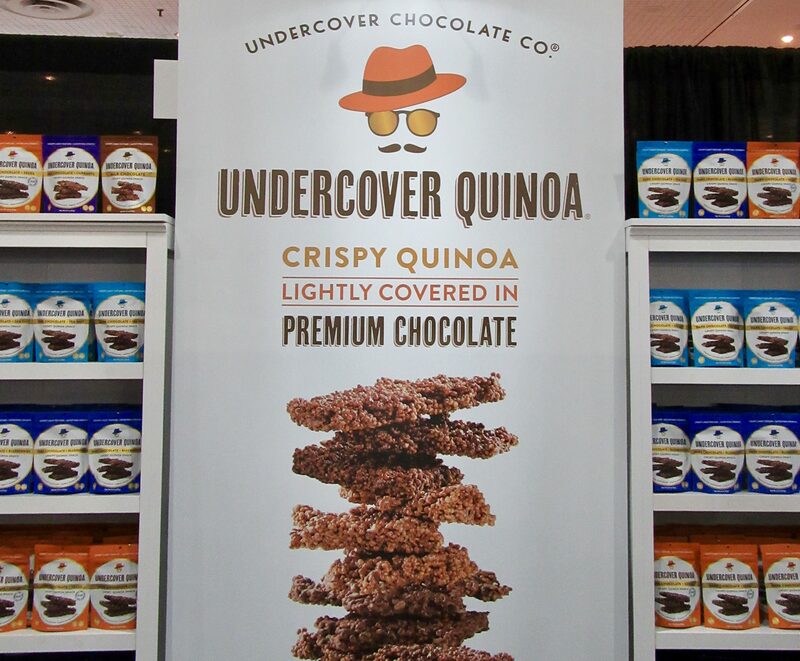 Undercover Quinoa has a very clever logo for portraying ‘quinoa in disguise,’ but I have to tell you that this product blew me away with its wildly addictive taste and irresistible lite crunch! Quinoa has been one of the more consistently popular choices for healthy eating for years, so it’s not exactly a hard sell. But if you can’t get your kids to eat it, try baking it into wafers and drenching it in chocolate. Sold! 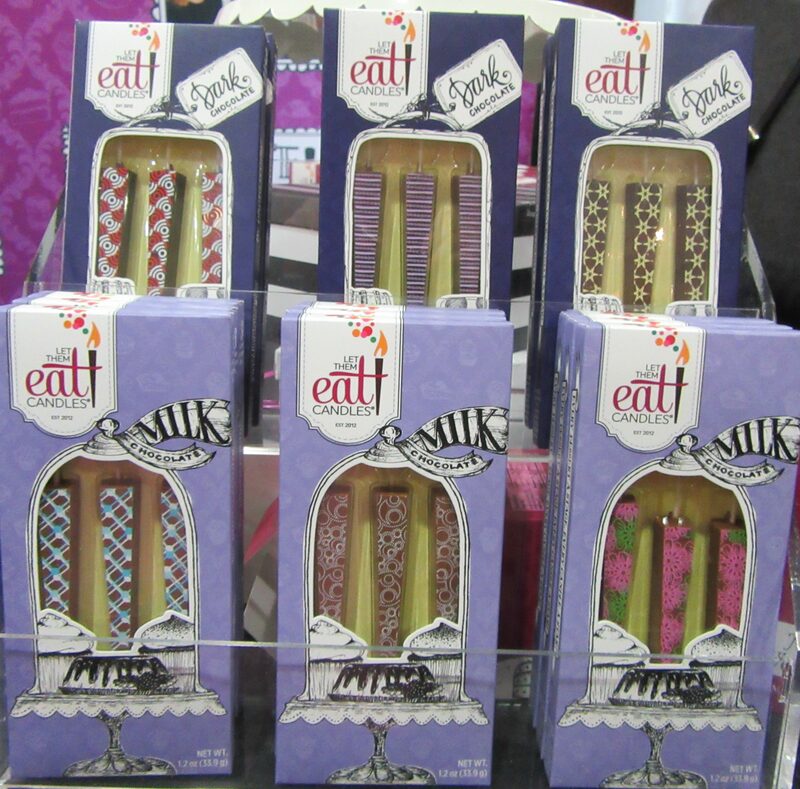 Chocolate lovers at SFFS never have difficulty finding something a little different to satisfy the sweet tooth. 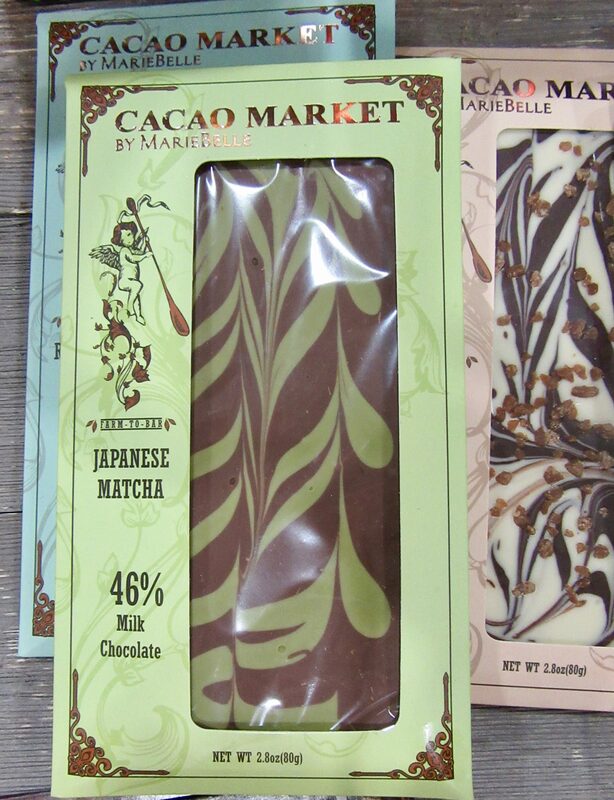 Check out this Japanese Matcha Milk Chocolate bar from Cacao Market by Mariebelle New York Chocolates. Exotic! 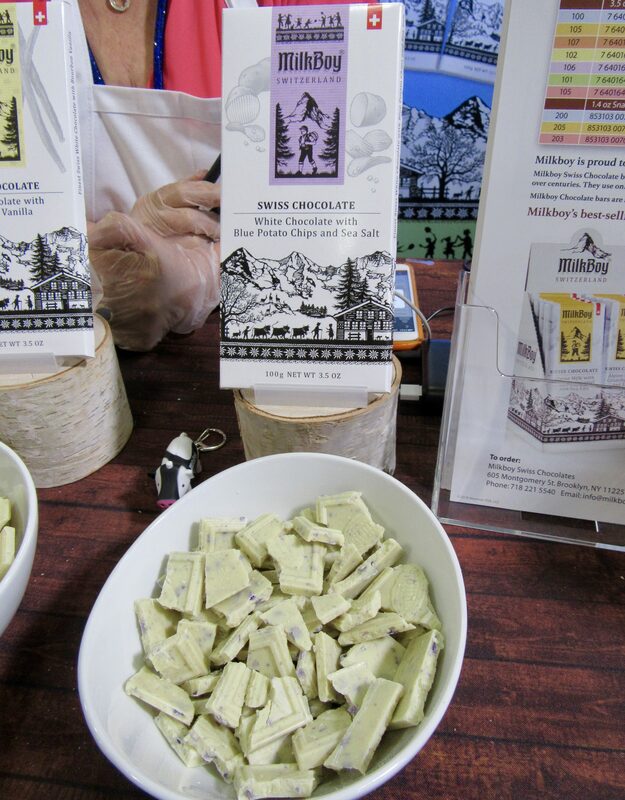 Milk Boy Swiss Chocolate’s White Chocolate with Potato Chips and Sea Salt bar helped that company make sofi™ Award history this year, winning the award for best new product in the category for milk and white chocolates! 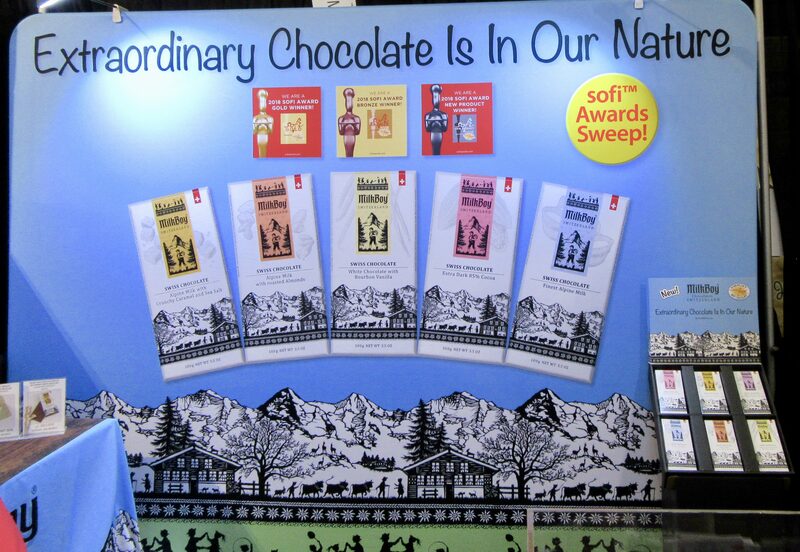 The gold award in that same category went to Milkboy’s Swiss Alpine Milk Chocolate with Crunchy Caramel and Sea Salt, and the bronze award went to their Swiss Alpine Milk Chocolate with Roasted Almonds. As the first company to win three chocolate category awards in a single year, Milkboy took home a trio of honors equivalent to the Oscars for specialty food! Congratulations! 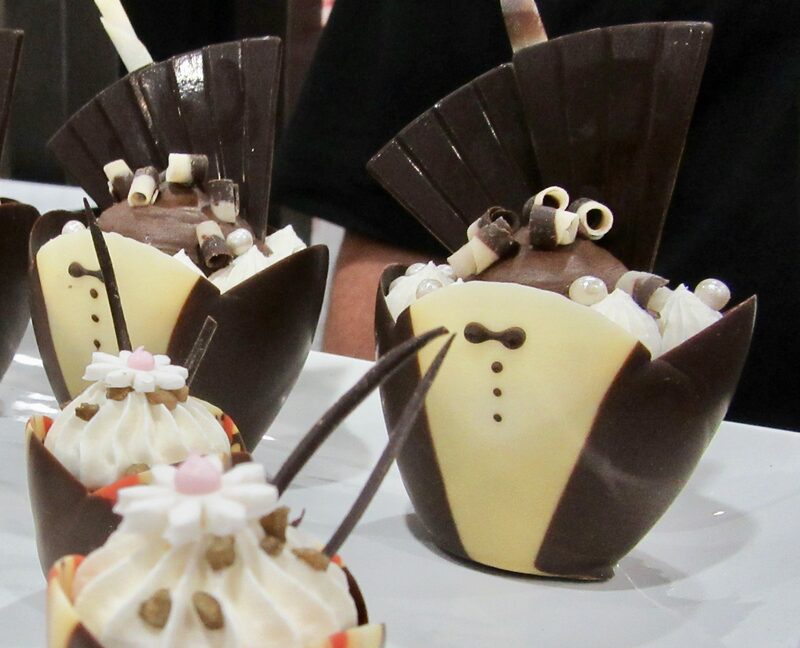 In the category of ‘food made gorgeous,’ Mona Lisa decorations of Chicago makes chocolate cups, shells and assorted decorations that can transform your desserts into elegant works of art! These desserts look almost too beautiful to eat! 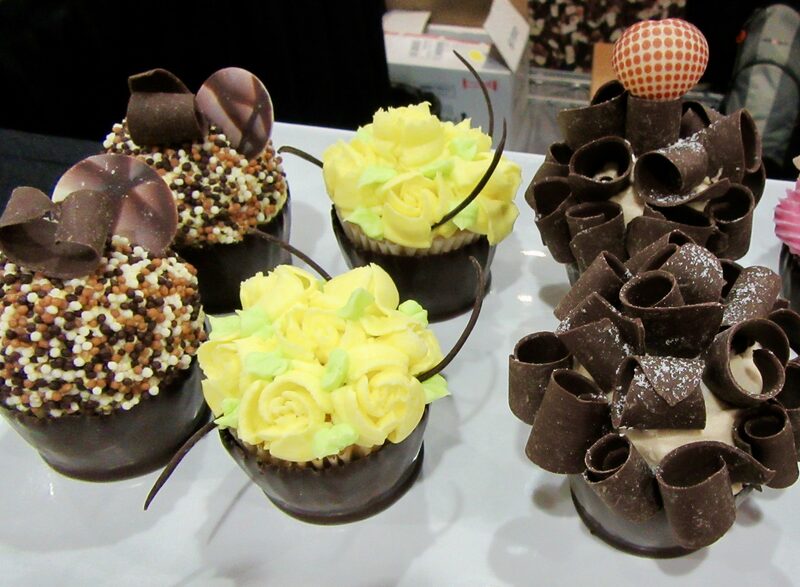 Check out Mona Lisa’s full line of gourmet chocolate decorations at This Link! Mona Lisa Tuxedo Tulip Cups Stuffed with Chocolate Mousse! 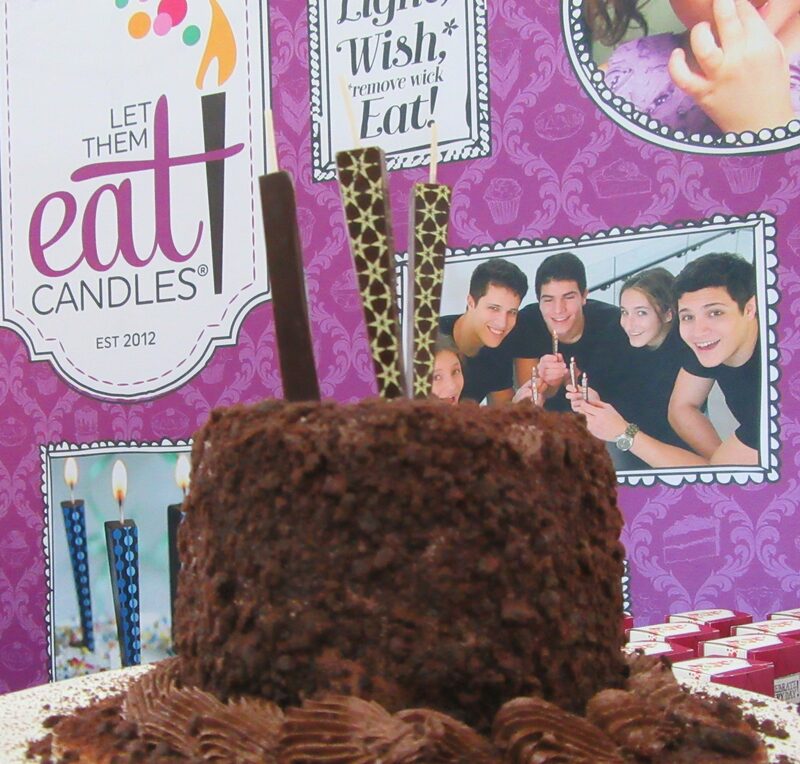 Just when you thought there could not be one more unique and original product made from chocolate, along comes Let Them Eat Candles, which are, literally, Edible Chocolate Candles for every type of celebration! Available in boxes of three candles, in either milk or dark chocolate, Let Them Eat Candles come in a variety of printed designs and they can even be custom printed with your company logo or monogram for wedding. Just don’t eat the wick! 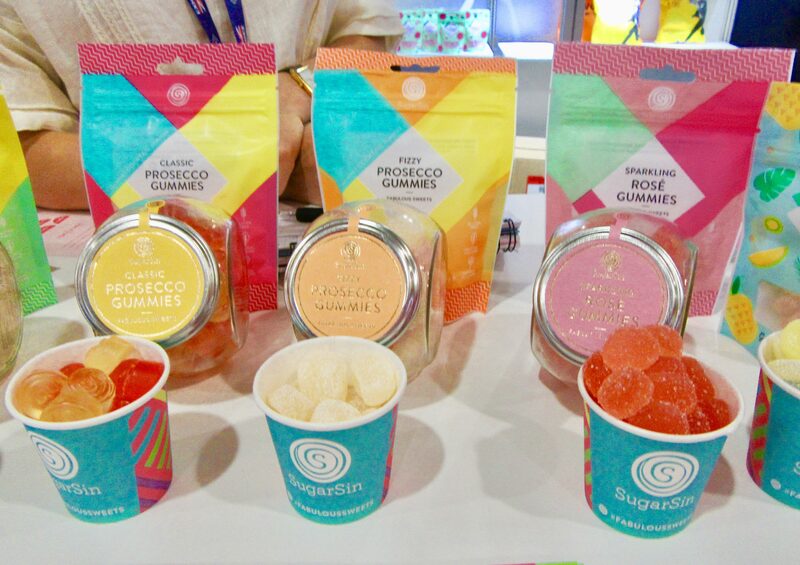 I bet you know someone who would love these Prosecco Gummies candies by SugarSin. This UK-based confectionary makes assorted Cocktail Flavored gummies as well. Check them out! 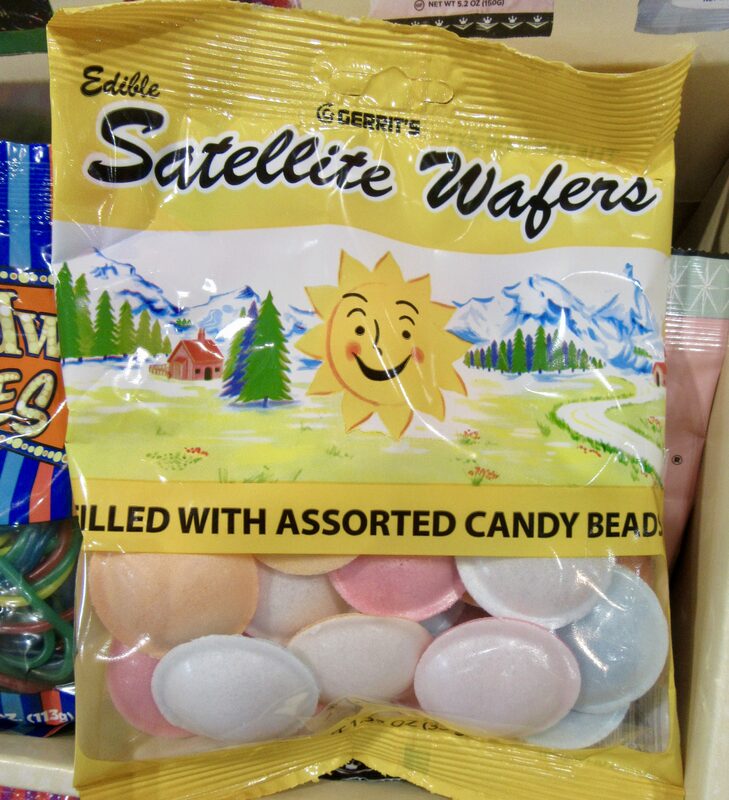 With their slogan “Taste the Memories,” Gerrit J. Verburg Company is always a huge hit at the show, with their nostaliga-inducing line of old-fashioned candies — like these Satellite Wafers — that delight the kid in each one of us! 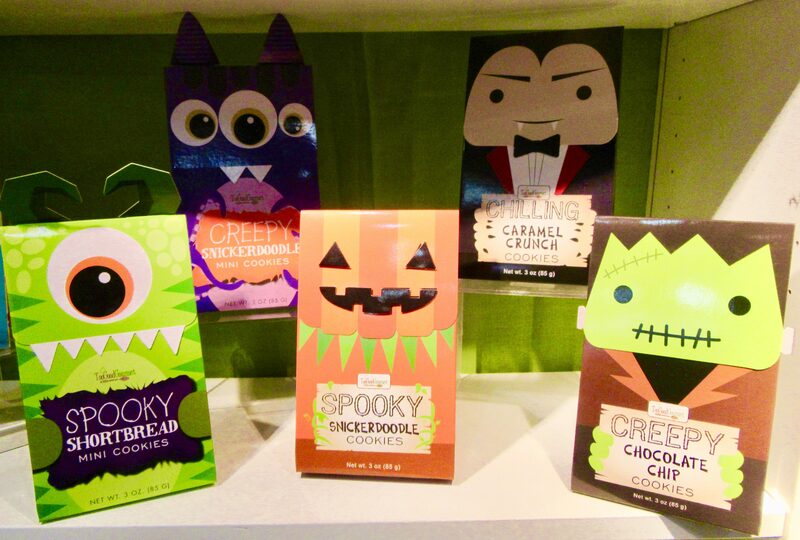 Too Good Gourmet is ready for Halloween by placing its delectable cookies inside this adorable (and scary!) seasonal packaging! 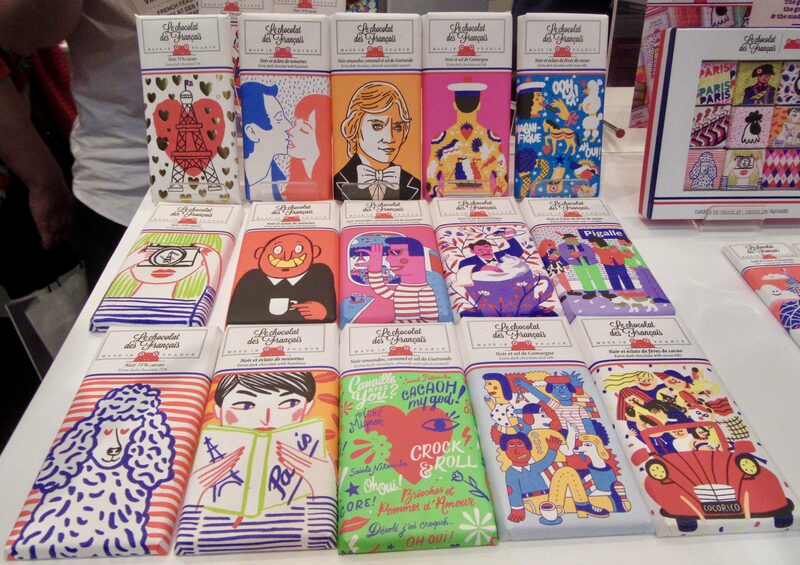 Le Chocolat des Français is a line of French chocolate bars that have a playful, and unique brand identity that features a variety of amazing illustrations on its packaging. Take a look! Designs this bold and exciting (collectible, even!) guaranteed Le Chocolat des Français an appearance in this recap — and the Chocolate tastes great, too! You’ve heard of Beer Nuts brand peanuts and bar-snack mixes, which are marketed directly towards pairing with beer, but now Portugal-based Nuts Original snacks is giving Beer Nuts a run for the bar tab, so to speak. Nuts Original is the first company to create an entire line of select snack mixes that are perfect for pairing with not just beer, but also wine, or the cocktail of your choice — the first ‘bespoke’ cocktail snack, if you will! Each bag of Nuts Original contains the perfect blend of crispy crackers, dried fruits, and oven-roasted nuts, all optimally seasoned for flavor enhancement, to complement the special ‘moment’ of your drinking experience. 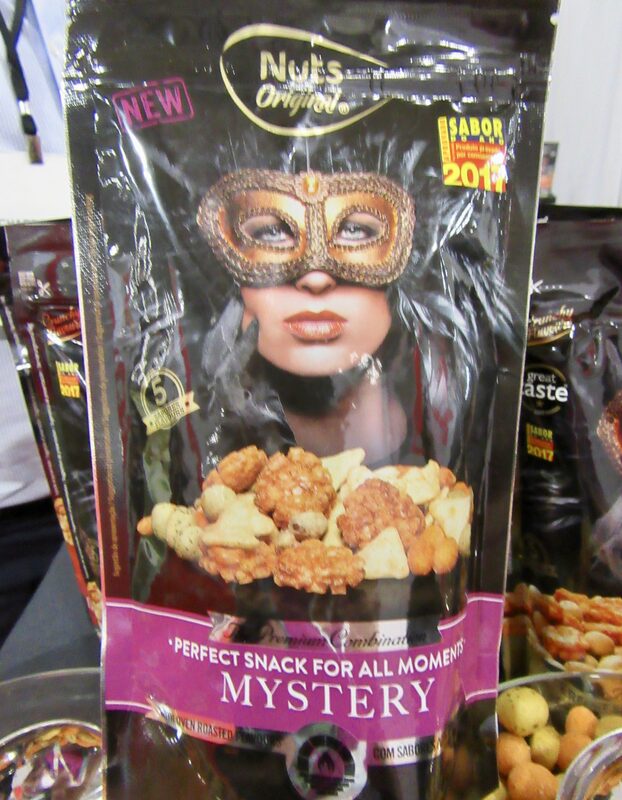 I also love their mysterious, masked spokesmodel, who reminds me of Wonder Woman! 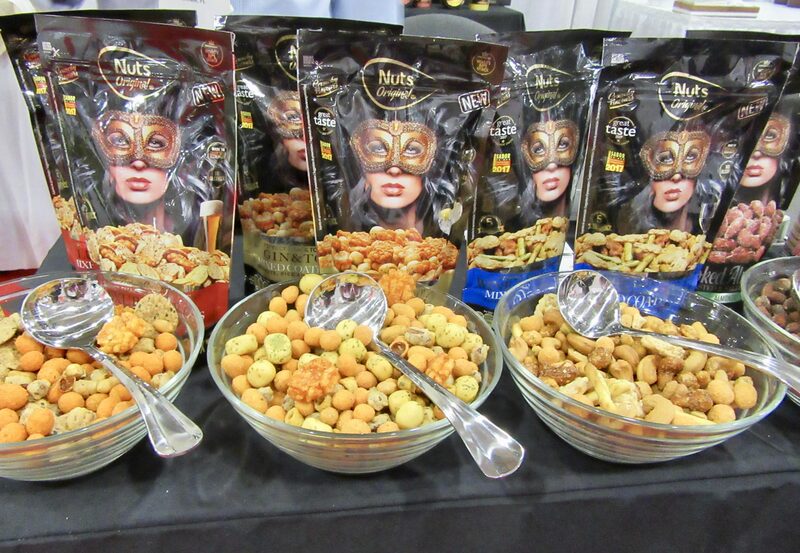 Find out more about Nuts Original cocktail snack mixes at This Link! 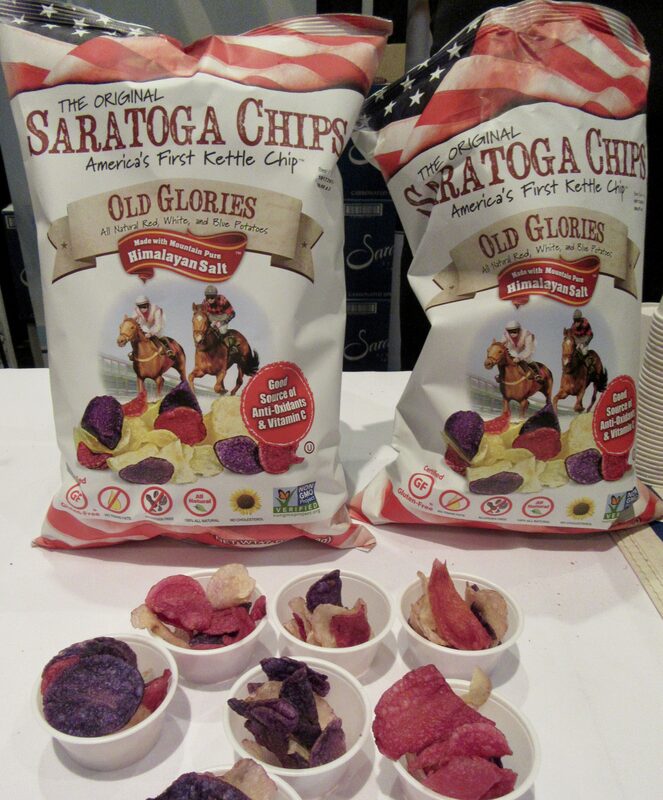 Too bad that this year’s July 4th celebration has passed, because what an ideal occasion that would be to break out the Saratoga Old Glories Kettle Chips – Red, White and Blue goes crunch! 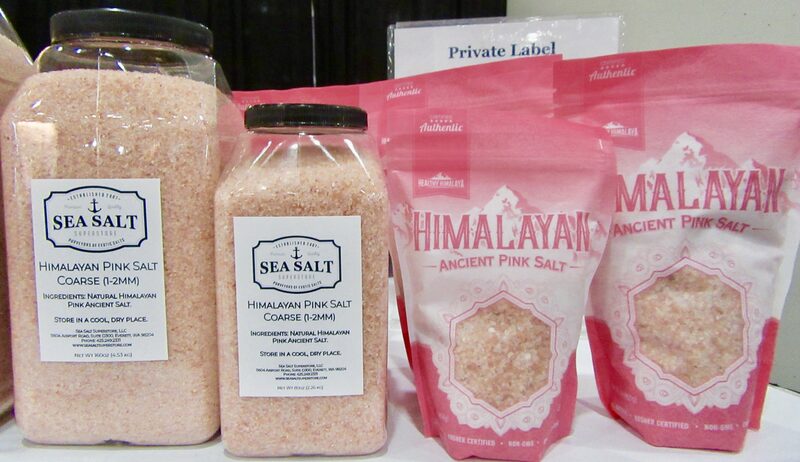 Sea Salt Superstores (purveyors of exotic salts) Himalayan Pink Salt wins Pink Thing of SFFS18! Because, Pinkness! 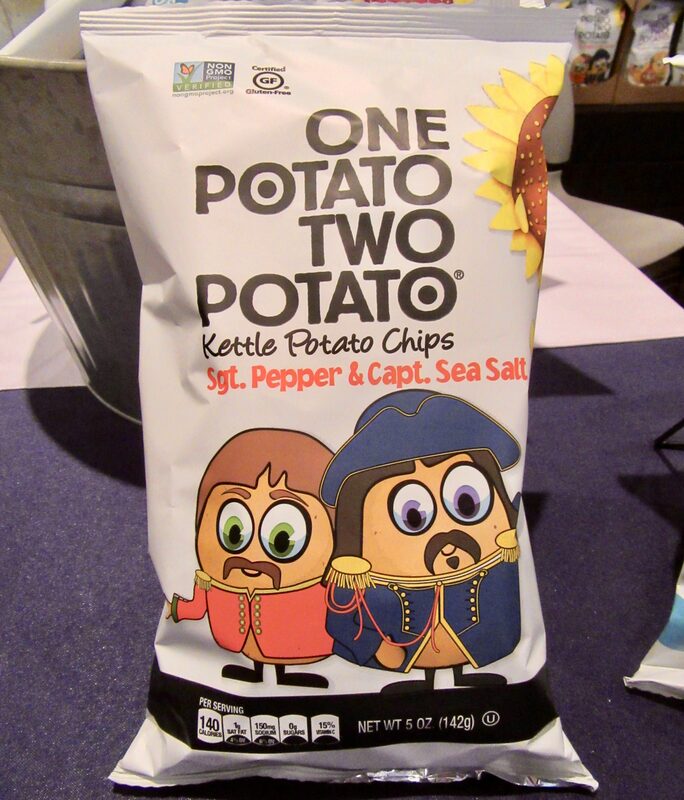 One Potato Two Potato brand Kettle Potato Chips won my heart with their adorable homage — in both bag design, and name — to The Beatles, with their Sgt Pepper & Capt Sea Salt Chips. Squee! 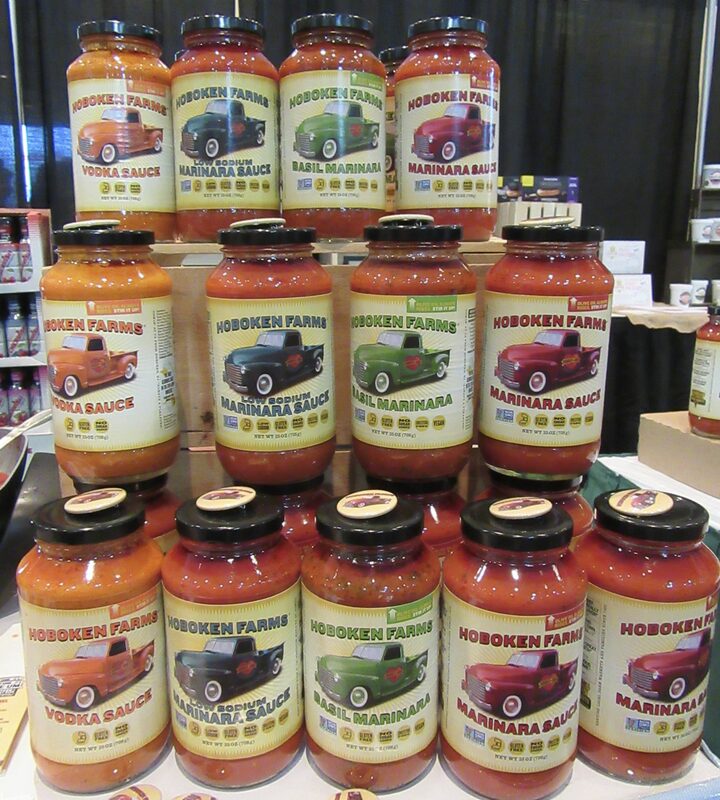 The label for Hoboken Farms organic Pasta Sauce, with its colorful depiction of a vintage a pick-up truck, is a work of art that’s worthy of the high-quality, farm-to-table style sauce that you’ll find inside the jar! The most innovative origin story for product packaging at SFFS18 belongs to Florida-based Surprise Drinks company. 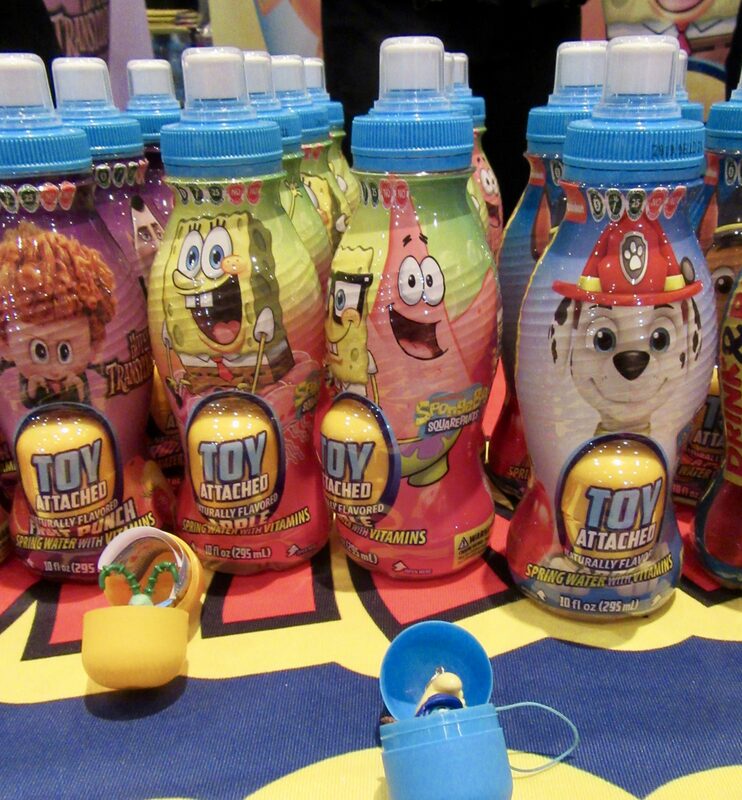 In 2006, inventor and current CEO of Surprise Drinks, engineer Pavel Dlouhy, developed a patented system of a drinkable beverage in a bottle with a toy hidden in a capsule attached to the bottle (Drink&PlayTM). Dlouhy’s inspiration for the Drink & Play patented bottle was the vision of his wife, who was pregnant at the time with their first child. Dlouhy approached the Walt Disney Company, which became the first license for Surprise Drinks in Europe. 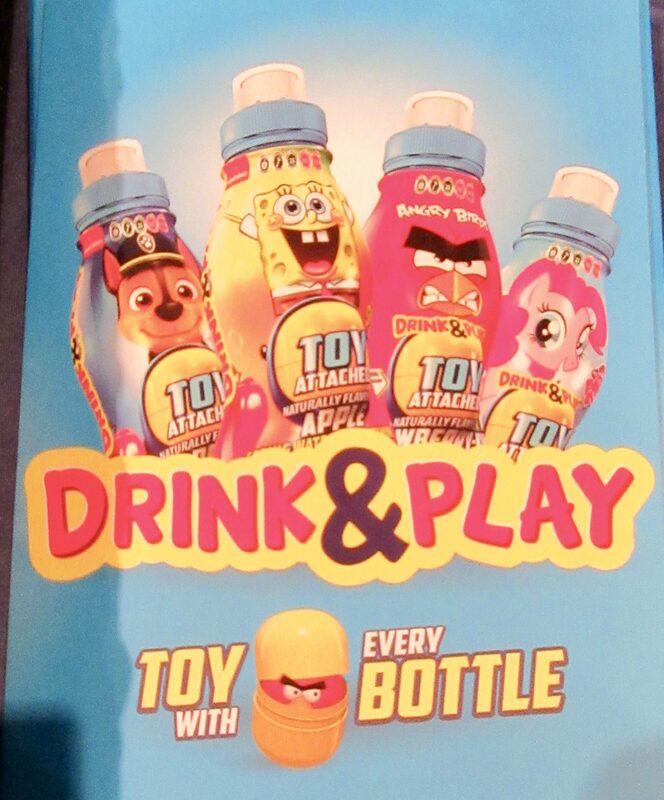 The heritage Disney brands, along with all the up and coming licenses associated with Disney have elevated Surprise Drinks to one of the top selling children’s beverages in Europe. 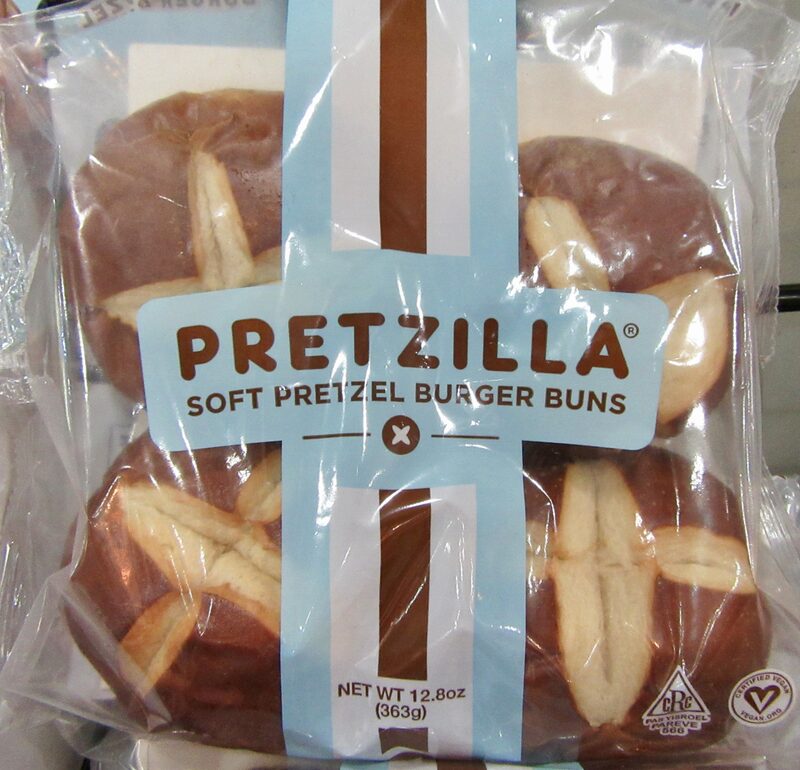 Pretzilla Soft Pretzel Burger Buns: an absolutely delicious baked good with the best. name. ever! I want to eat them. It’s always fun to spend time browsing in the BBQ Sauces aisle. 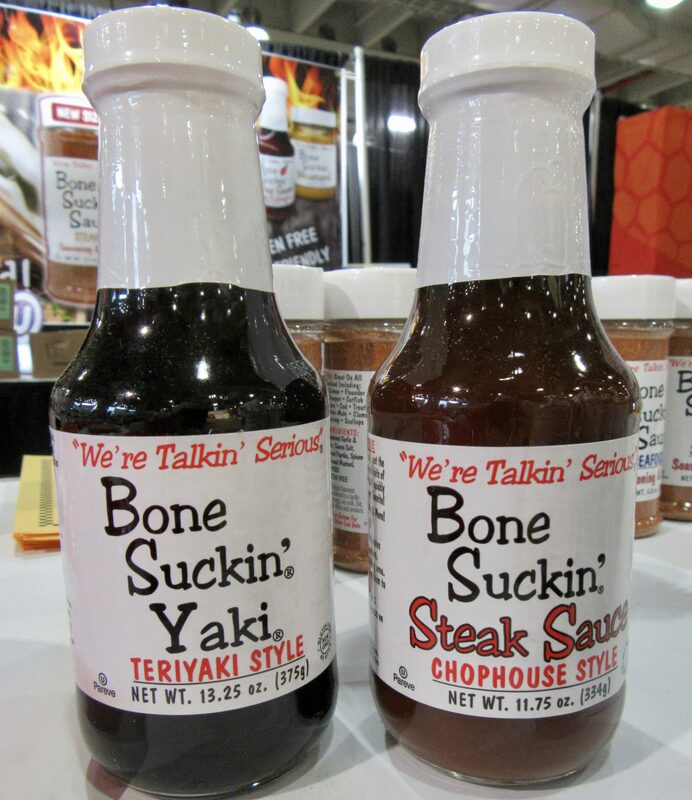 Spotting a line of sauces with a product-approprate name like Bone Suckin’ is just one reason why that is true. 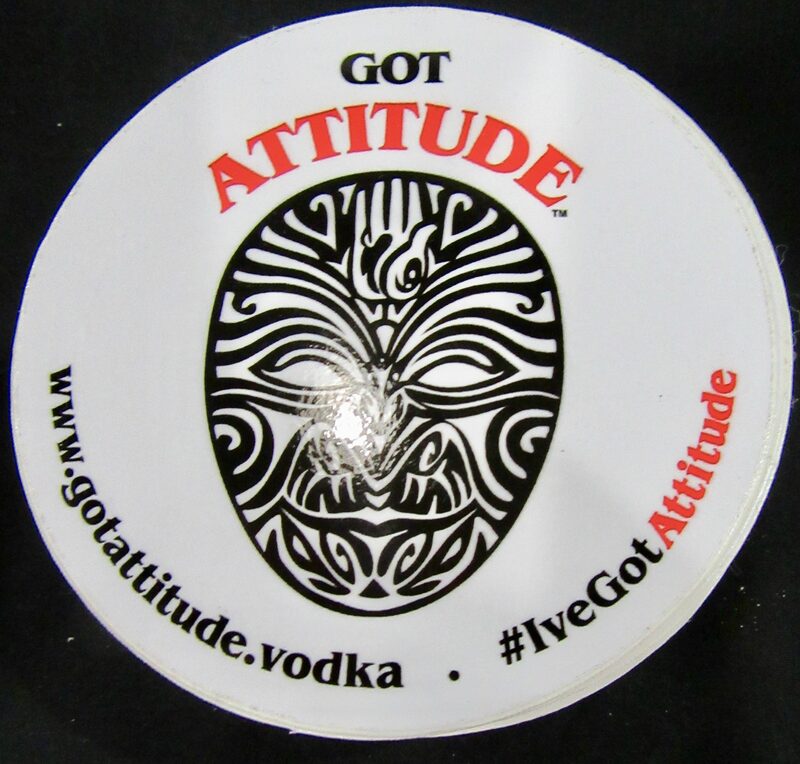 I’ve already mentioned how fond I am of Vodka, so it was extra sweet to encounter the folks at Got Attitude Vodka in the New Brands on the Shelf aisle. Even better: they were giving out free samples! 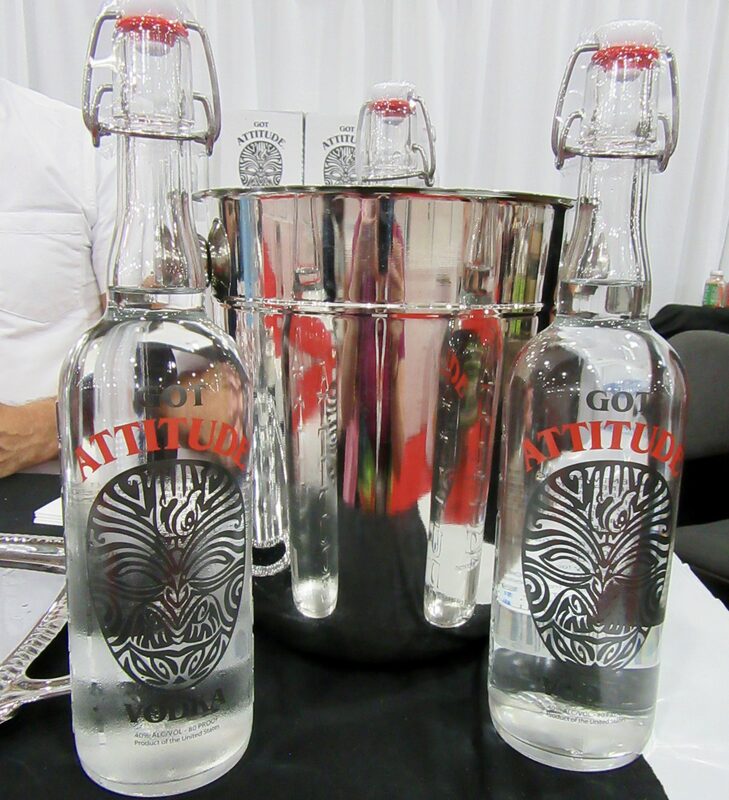 Got Attitude Vodka is not meant for those who follow the crowd. It is for the bold, and those who speak their mind. How does Got Attitude taste? In a word: Smooth. 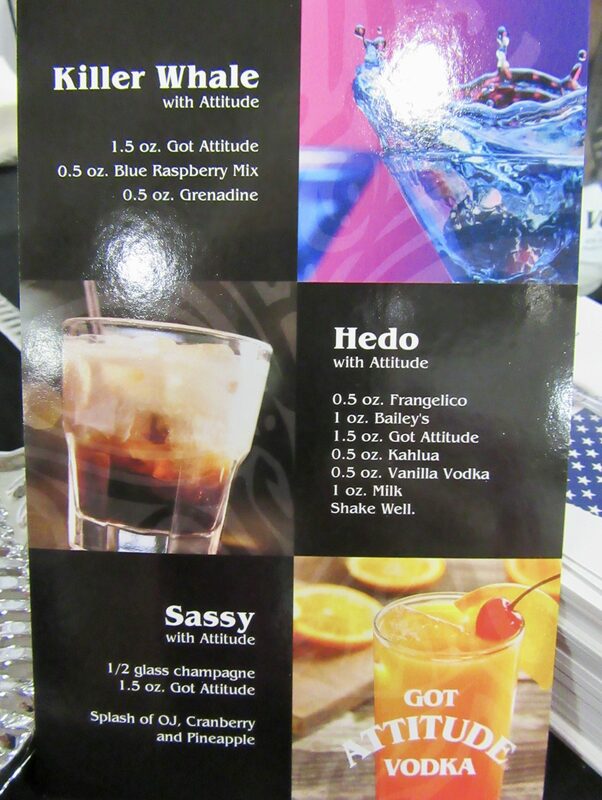 Why not make one of these Cocktails with Attitude after you pick up a bottle? Join the Got Attitude family at This Link! 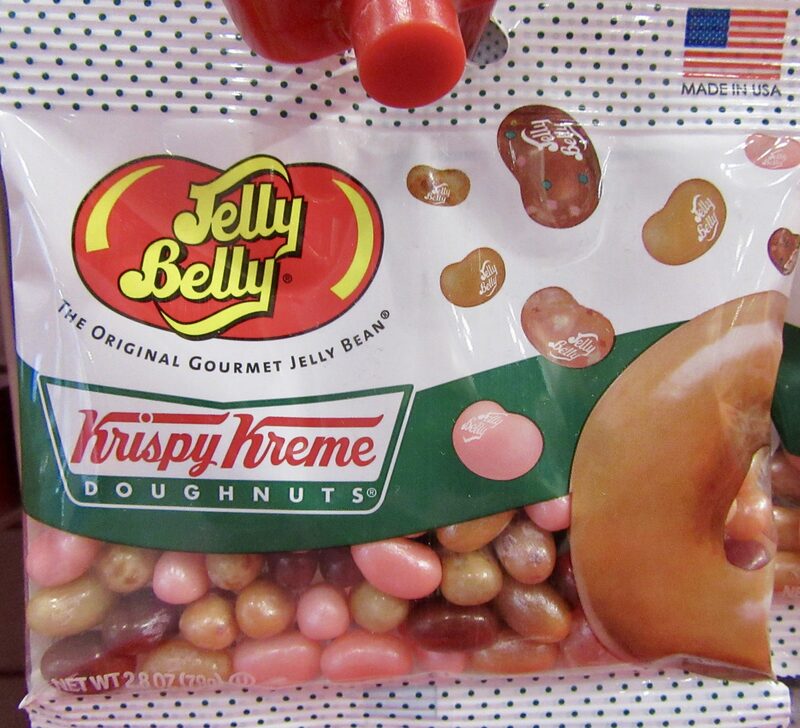 Jelly Belly — always ahead of the flavor trends — makes its first of two appearances in this post for their drool-inducing Krispy Kreme Doughnuts-flavored jelly beans! Here’s a flavor trend that I never cease to be captivated by: Birthday Cake — or, alternately, Cupcake — flavored . . . anything. 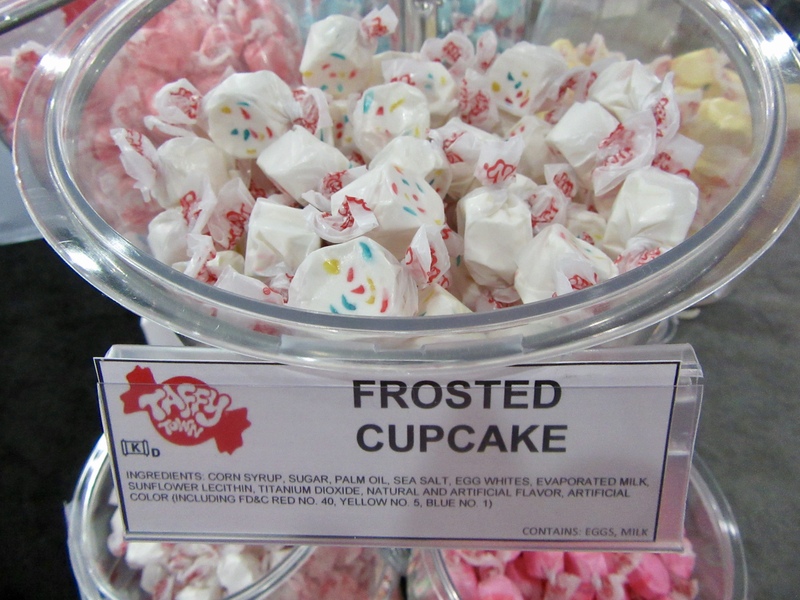 At SFFS18 it was apparent that folks have gotten quite creative with this idea, introducing such festive treats as Frosted Cupcake saltwater taffy from Taffy Town. 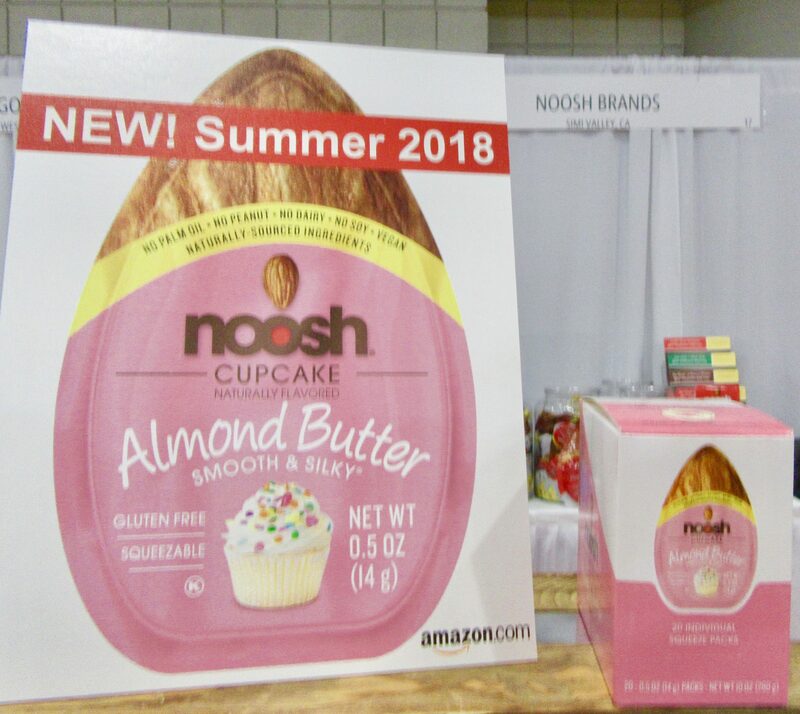 Over in the New Brands on the Shelf aisle, we came across Cupcake-flavored squeezable Almond Butter from Noosh! 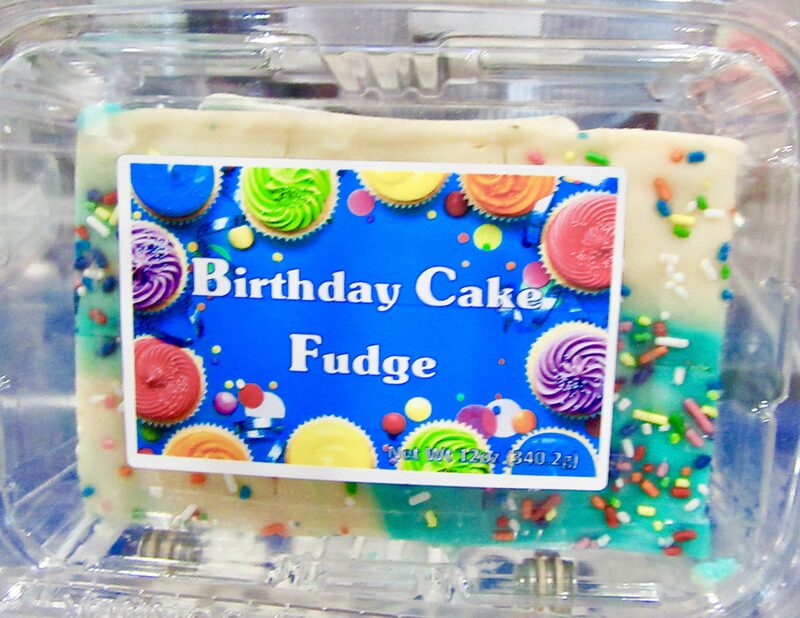 Country Fresh Fudge introduced their take on Birthday Cake Fudge — festive and delicious! 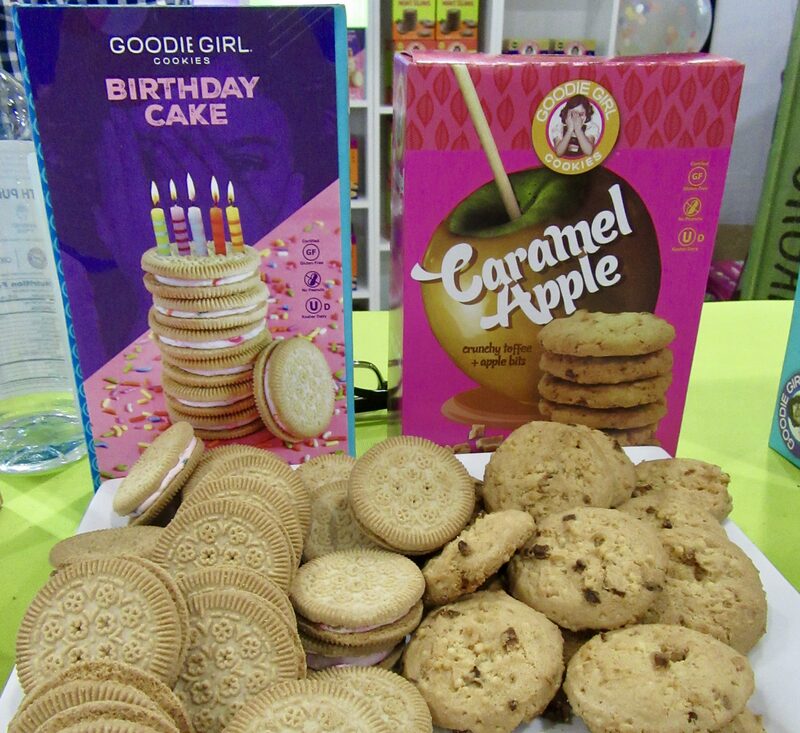 Goodie Girl gluten-free cookies got into game with their newest variety, Birthday Cake Cream sandwich cookies! 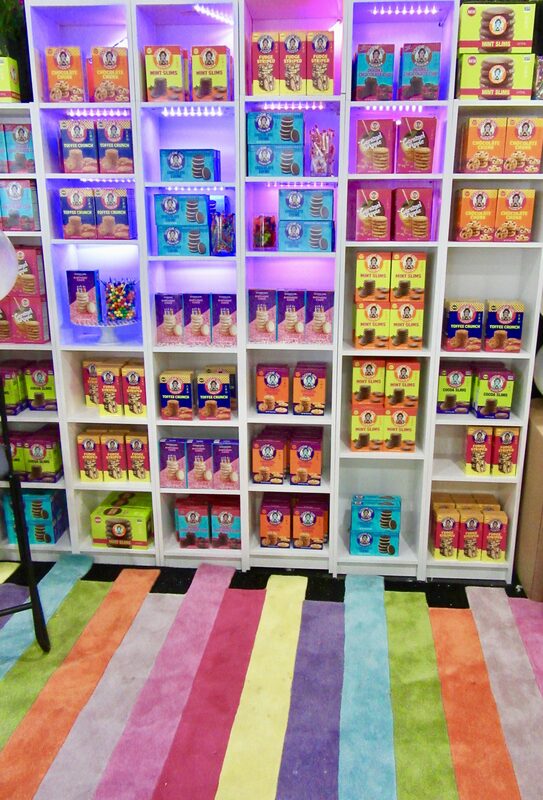 And check out the gorgeous spectrum rug in the Goodie Girl booth! Now that’s visual merchandising done right! 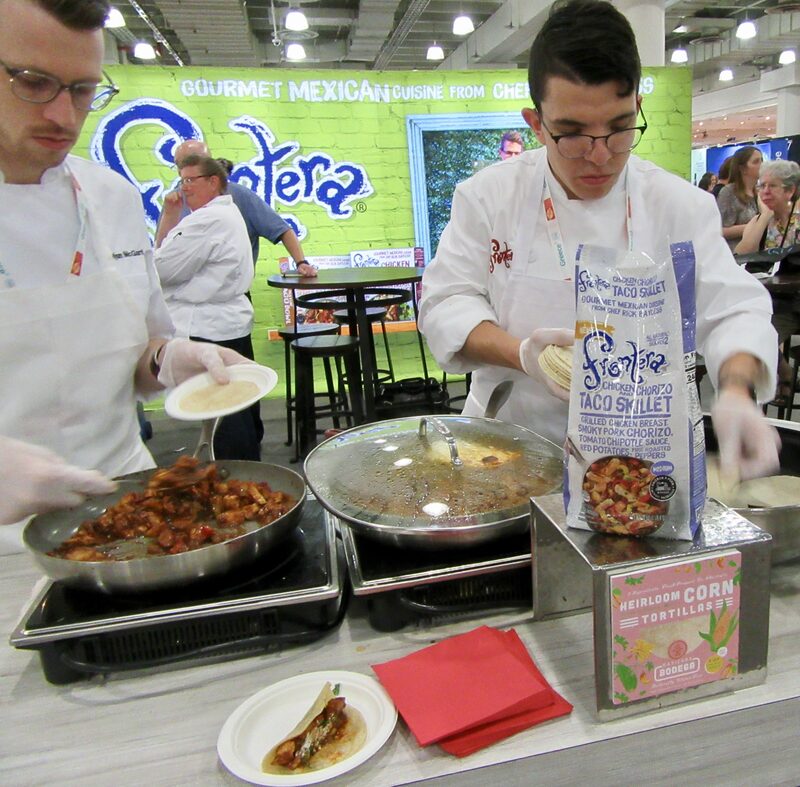 Here are a few other creative and eye-grabbing ways that exhibitors stood out from the pack, drew crowds to their booths, and got folks to hang around for a few extra minutes in the vast sea of 2,600 exhibitors! 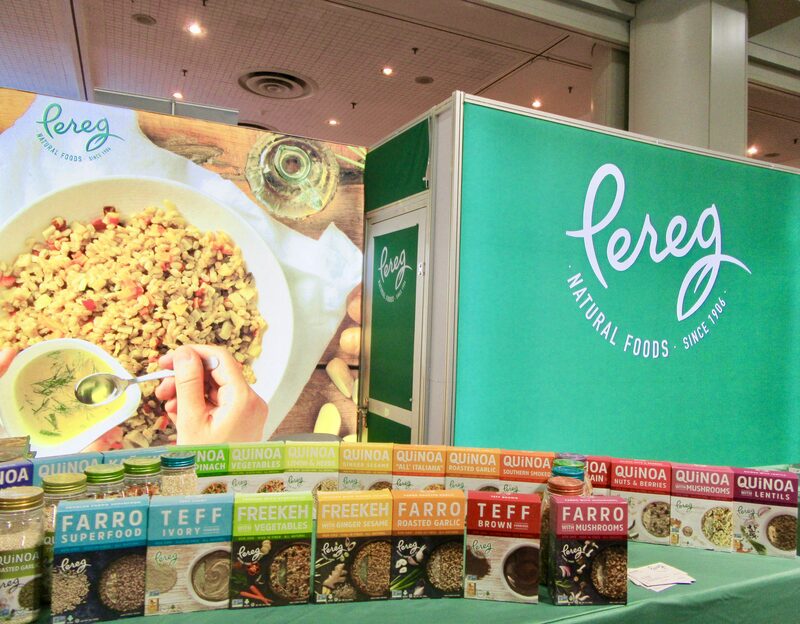 Pereg Natural Foods also took advantage of the universal appeal of a color spectrum that was created from the simple alignment of their product packaging. Lovely. 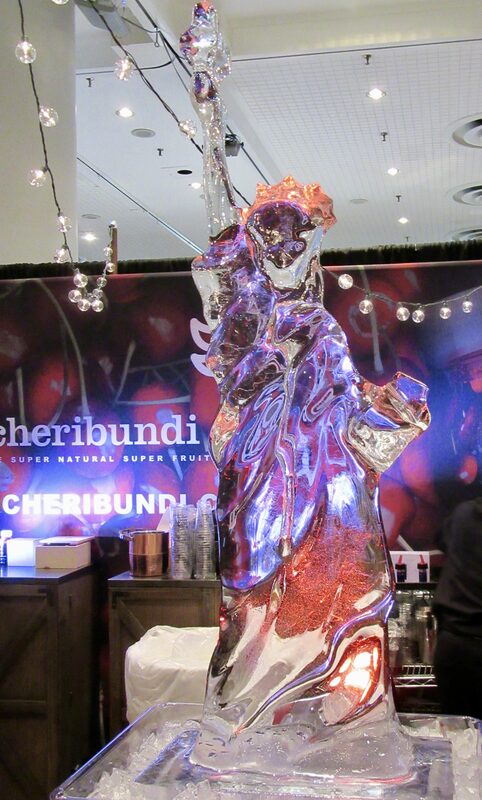 Cheribundi 100% natural Tart Cherry Juice knows that the cocktail party brings all the folks to the booth, and this statuesque ice sculpture of Lady Liberty served as a beacon to guide the cocktail-minded to their lively Sunday afternoon soirée. 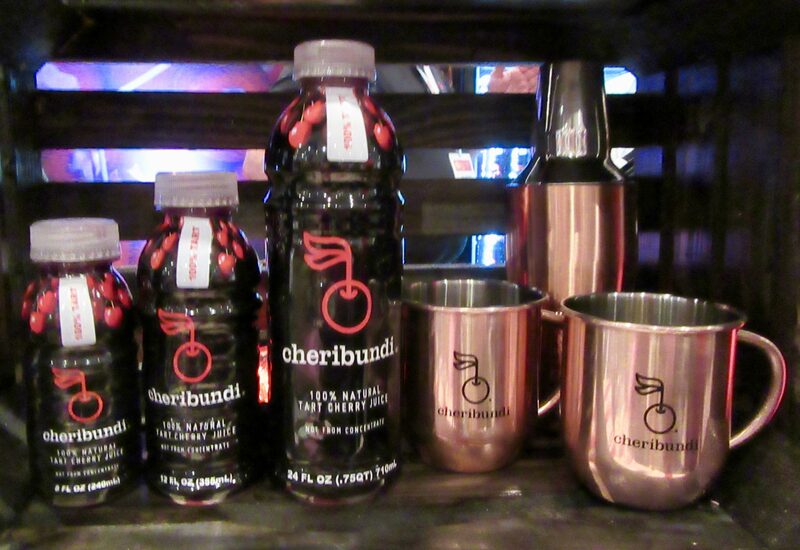 Brand representatives served both virgin and alcohol-enhanced cocktails which were expertly crafted to highlight the fresh fruit taste of Cheribundi; an ideal mixer that packs numerous health benefits including Phytonutrients and antioxidants! Plus, free swag! 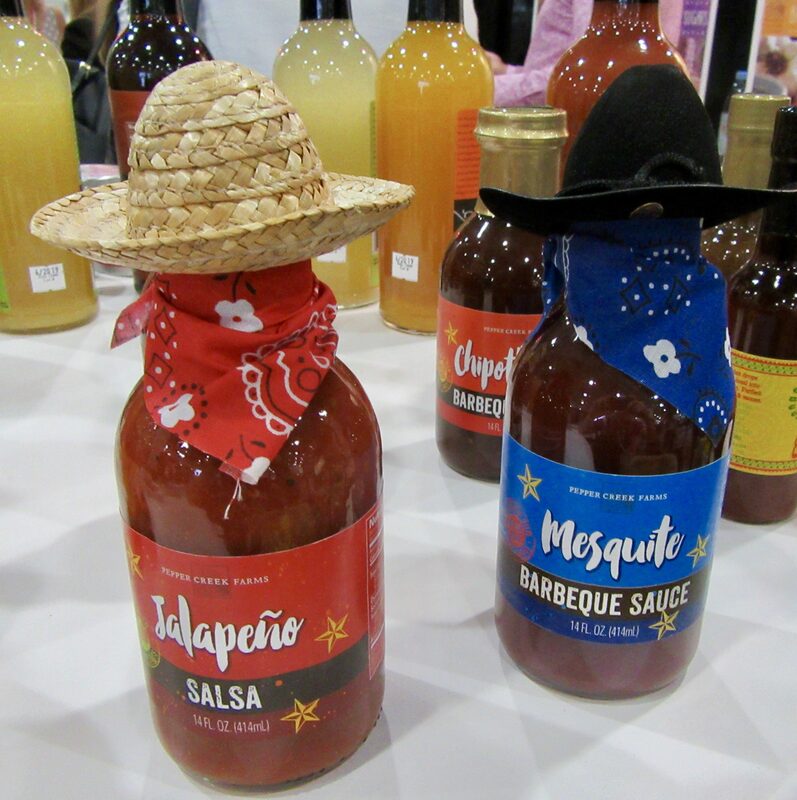 Pepper Creek Farms had the Instagram crowd in mind when they dressed-up their bottles of Salsa and BBQ Sauce in little hats and bandanas! Hey, it got my attention! 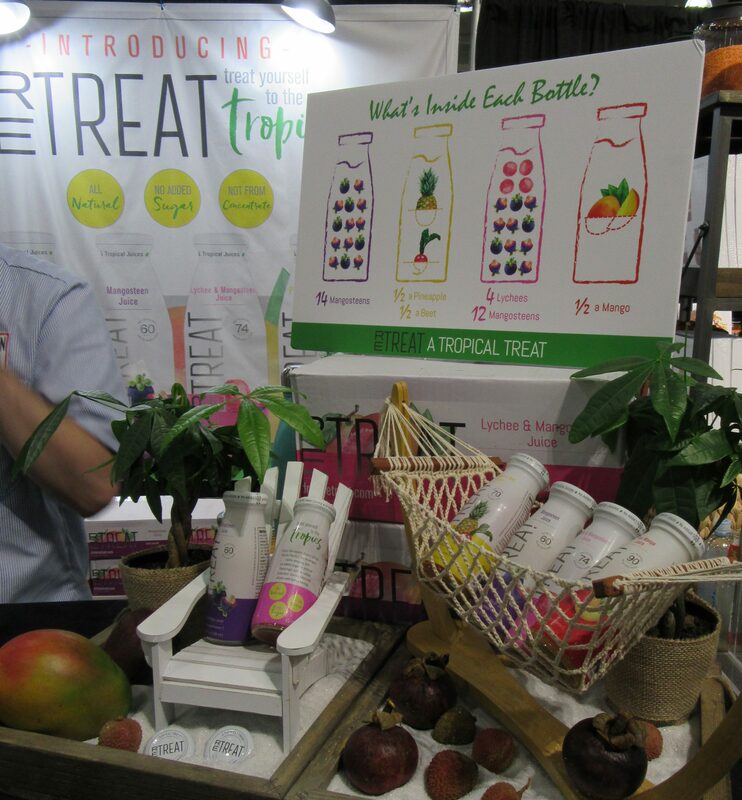 Retreat Tropical Juice Blends get their point across by displaying the bottles in a little hammock and Adirondack chair! 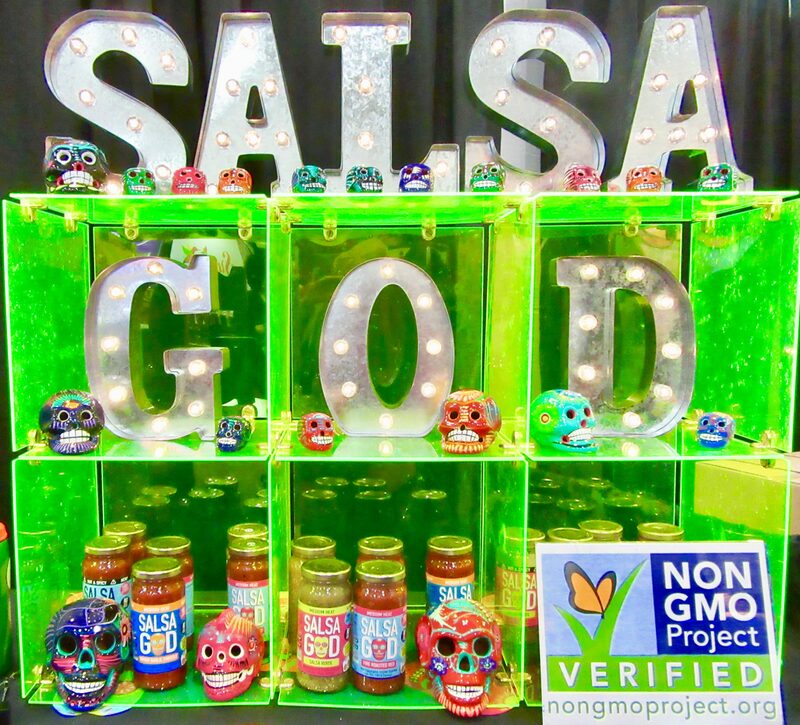 Salsa God’s booth display is simple, well organized, and full of cool skulls! Strawberry Hill Candy is best known for their clever line of Novelty Lollipops that have to be seen to be believed. What caught my eye most in their booth though were these oversize tea cup and saucer props with their Damien Hirst Spot Painting motif! 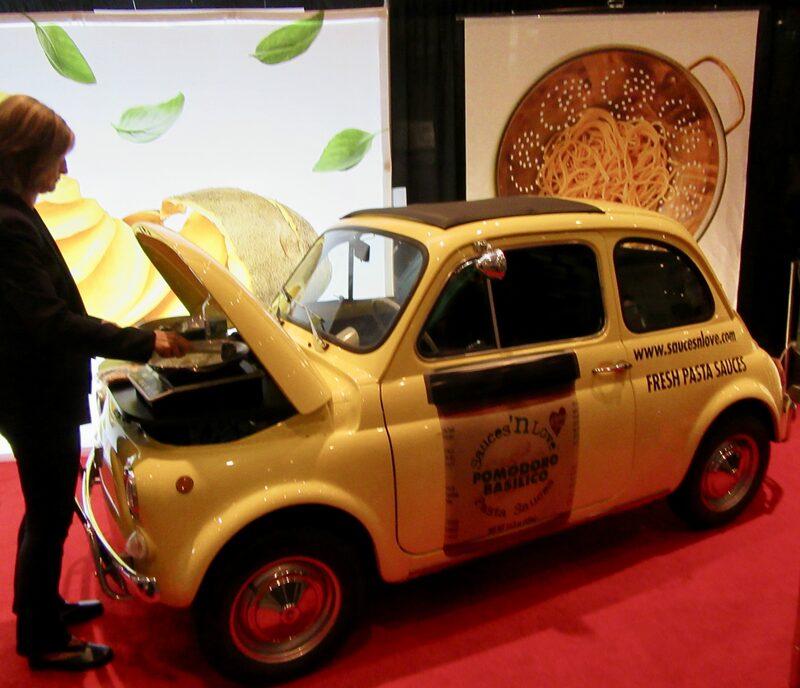 Sauces ‘N’ Love fresh pasta sauces cooked up one of their specialities dishes on a grill mounted on the engine of this car! 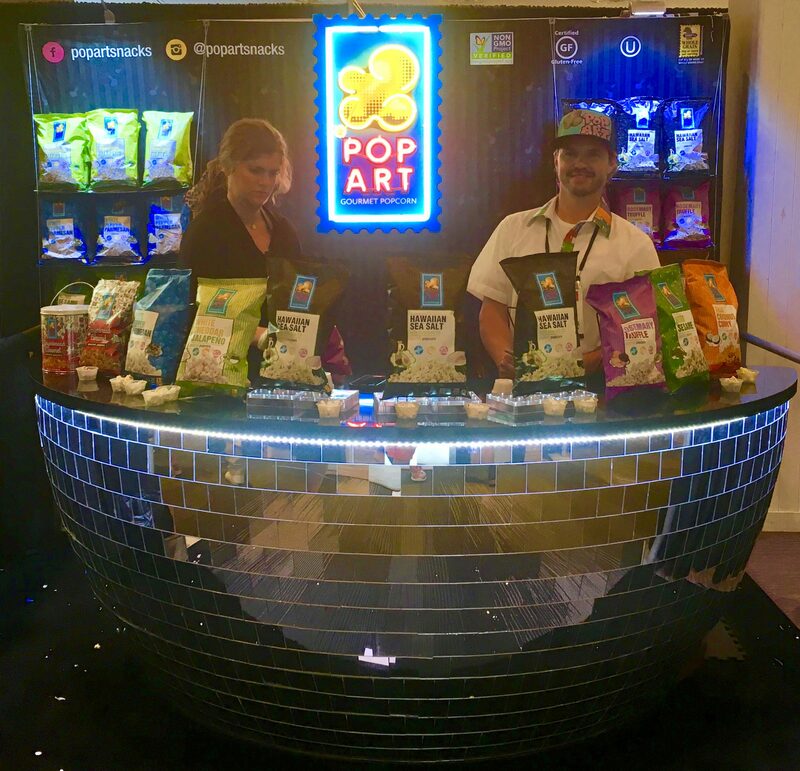 Pop Art Snacks Gourmet Popcorn is a pleasure to see at SFFS each year; not only for their Mirrored Disco Ball Booth — which is no doubt the envy of every exhibitor on their aisle — and for their numerous unique Gourmet Popcorn flavors, but because co-owner Mike always remembers my name! 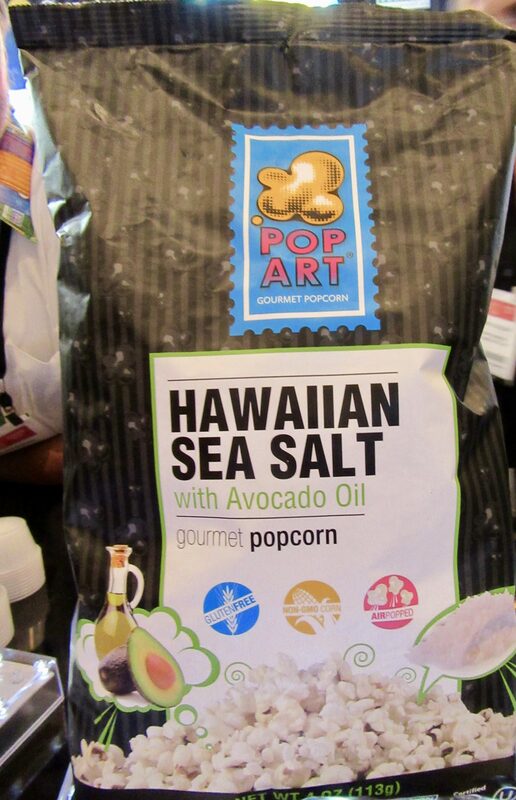 I highly recommend the Hawaiian Sea Salt with Avocado Oil Popcorn for its extreme deliciousness! So good! 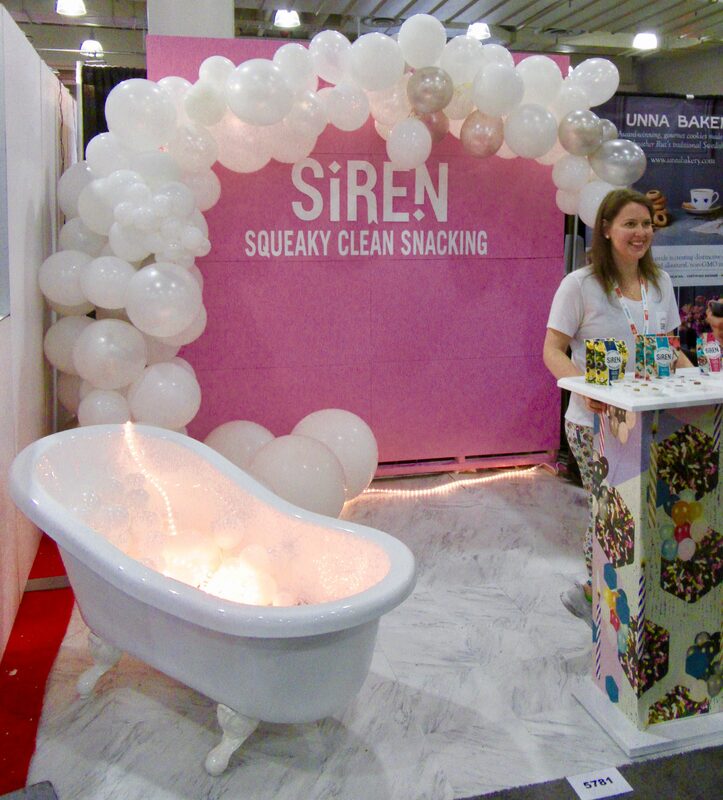 Siren Snacks emphasized the “Clean Snacking” approach of their brands’ delicious, plant-based range of protein bites by installing an old-fashioned clawfoot bathtub filled with balloons right in their booth! New, all-natural Spread Delights are single-serve, squeezable smooth spreads in Chocolate Hazelnut, Raspberry, and Almond varieties that will complement your toast, bagel, favorite pastry, or whatever strikes your fancy. 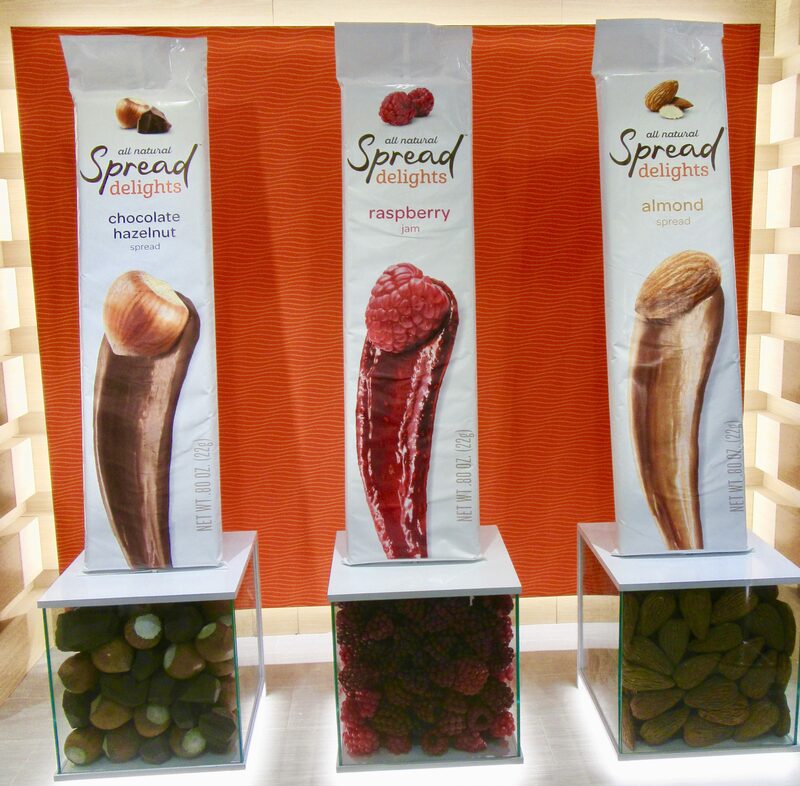 The Spread Delights booth felt like new car showroom with its life-size packet replicas of each flavor perched atop a lucite display case of that flavor’s man ingredient. Classic and Classy! Props or themed-booths are certainly not necessary to attract attention. 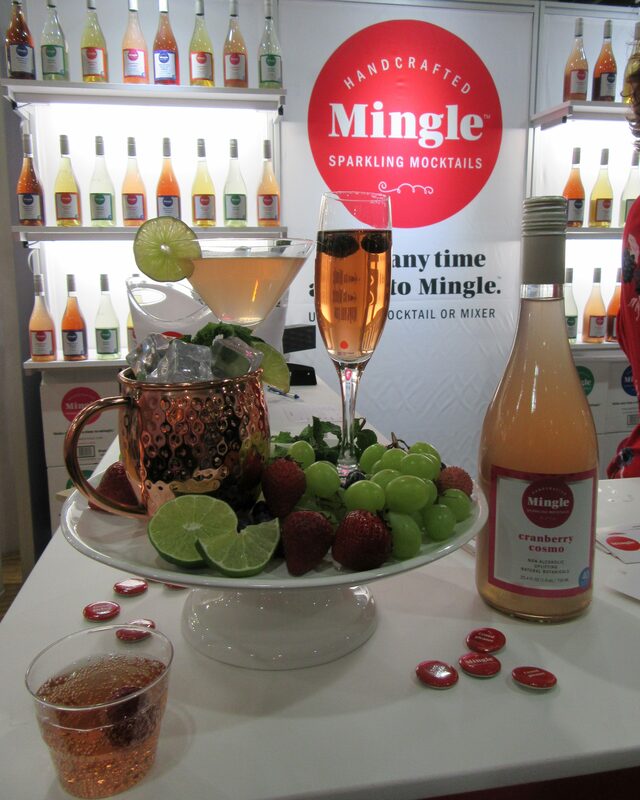 Mingle Sparkling Mocktails showed everyone how effective a straightforward approach can be with their clear branding and elegant product display. It was impossible to pass by their booth without stopping in for a taste of one of their refreshing non-alcoholic beverages! 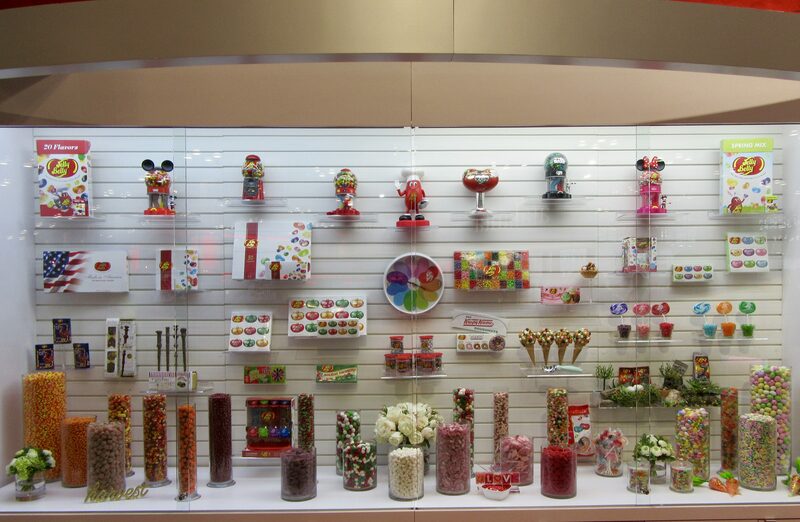 There’s a reason why the Jelly Belly brand makes its annual Manhattan land grab with one of the largest square-footage booths at SFFS — it’s because their merchandising is rather mind blowing. Everybody wants to hang out in the Jelly Belly booth. It’s like Christmas in there! 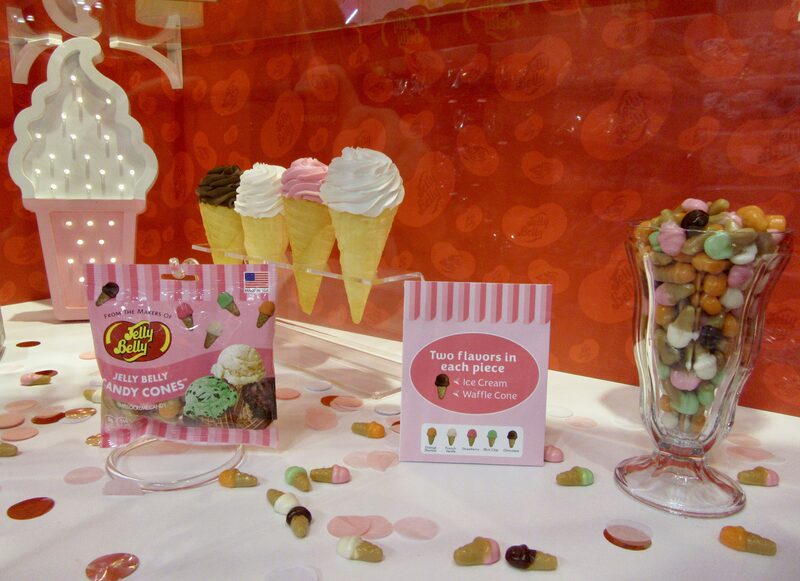 And look at how focused this display is for the new Jelly Belly Candy Cones! Forget that Candy Cones have two flavors that taste like both the cone and the ice cream in each piece, and just immerse yourself in this inviting fantasy landscape that features a parfait glass overflowing with candy, an ice cream cone-shaped light, and luscious looking fake ice cream cones in a rack. Now consider that Jelly Belly has hundreds of flavors, and this tableau is for just one flavor of Jelly Belly. This is why they are number one, people! 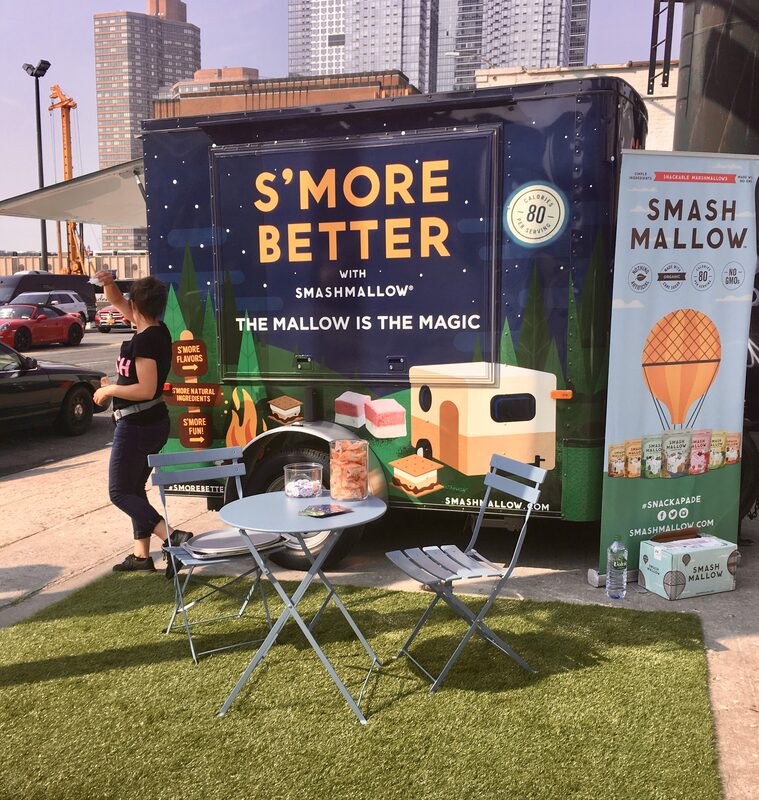 Last but not least, a shout out to the lady handling the day’s extreme heat while manning this booth for Smashmallow all-natural gourmet marshmallows (their slogan: “S’More Better”) who set up across the street from the Javits Center! Maybe next year they will move their booth so she can enjoy some nice air-conditioning! Thanks to the Specialty Food Association for another great show, and see you next summer! This post made me hungry! Great pix and recap. Thanks WorleyGig! Honored to be among this group! Viva Fancy Food.